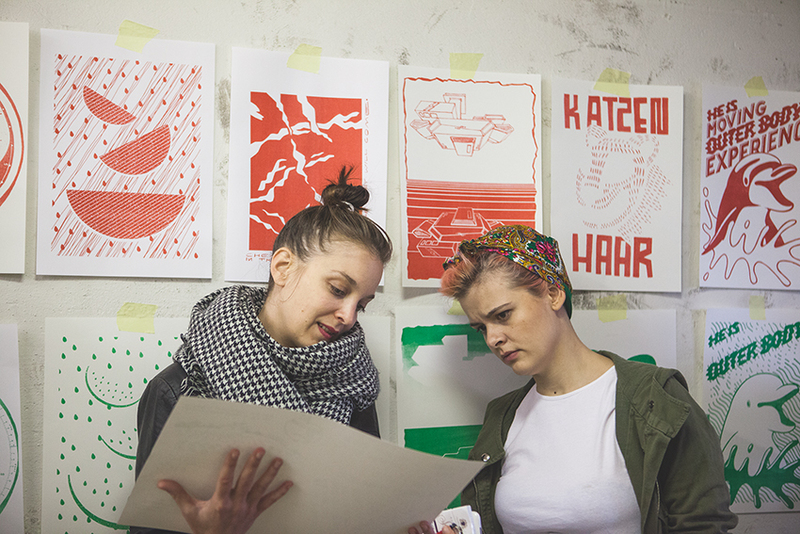 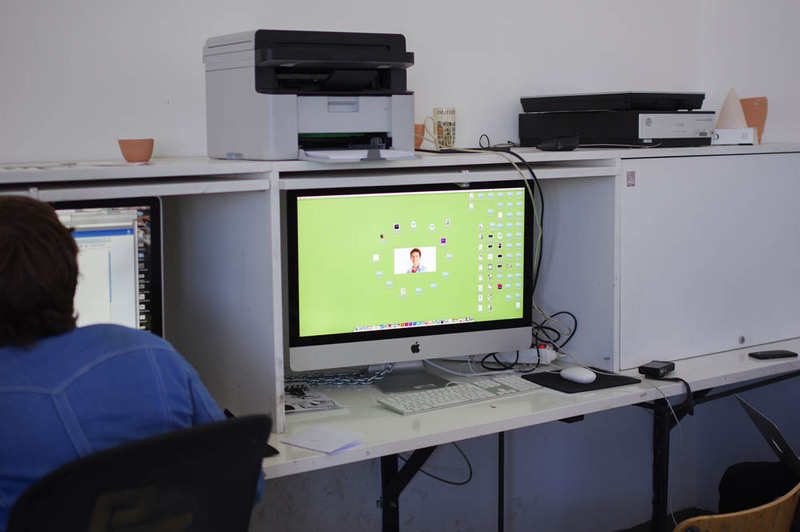 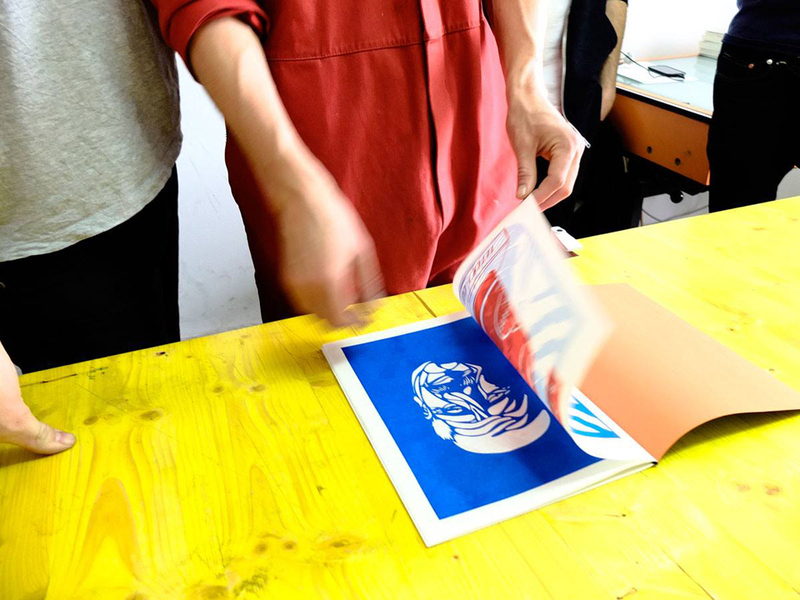 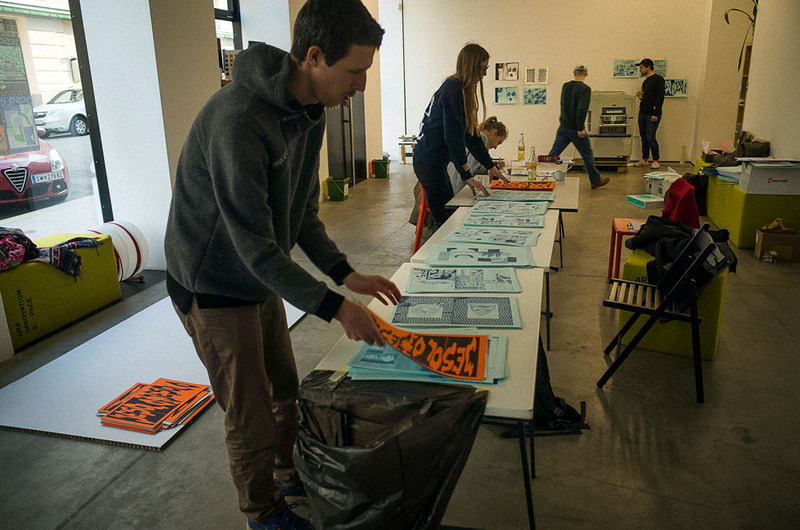 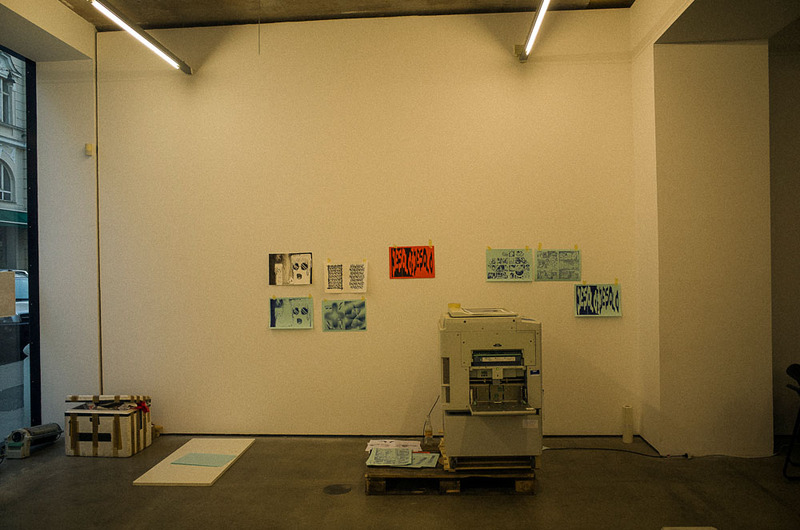 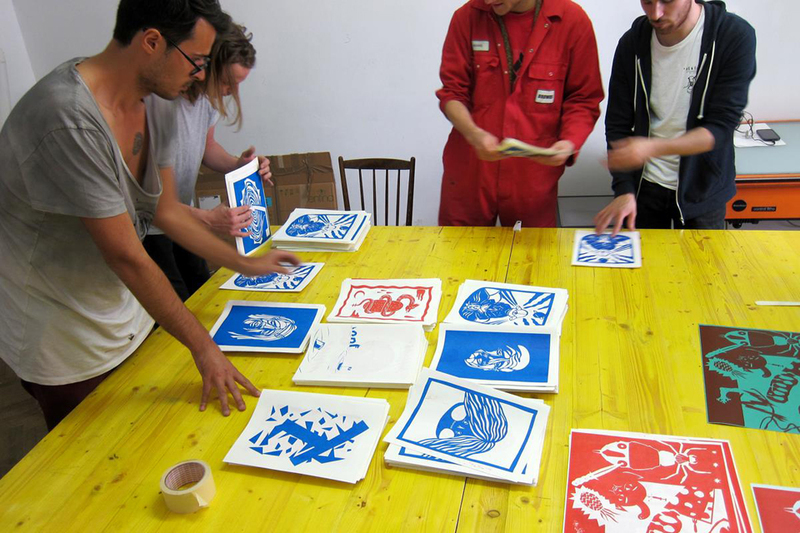 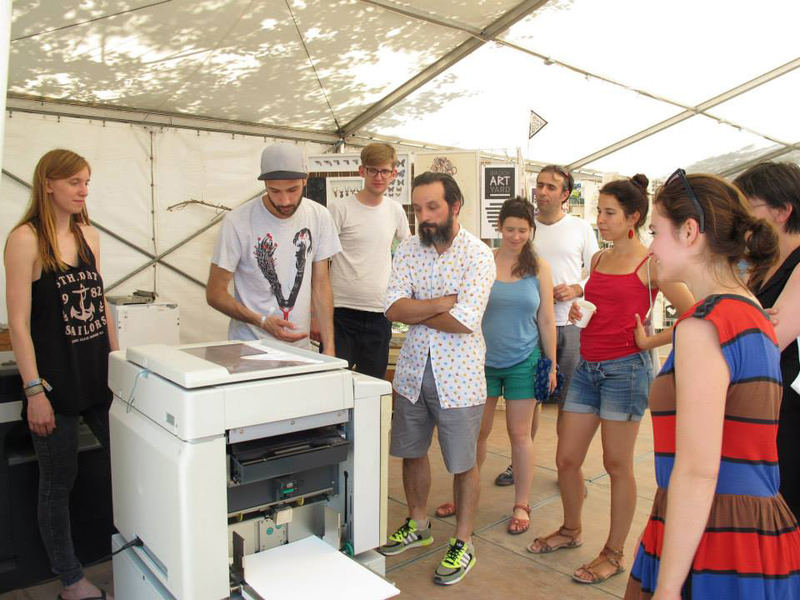 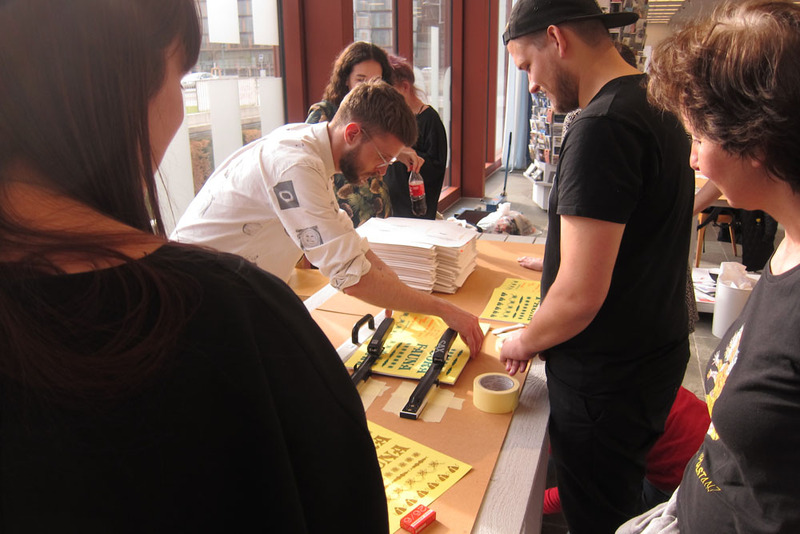 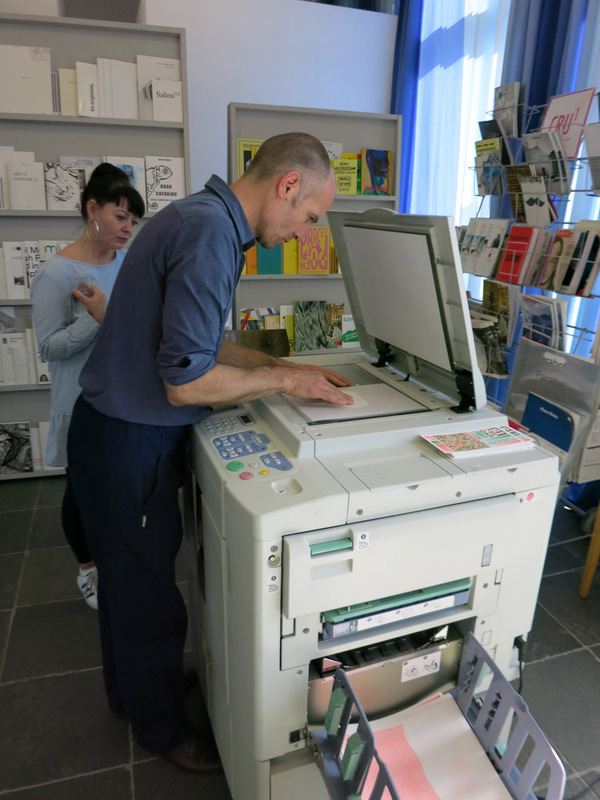 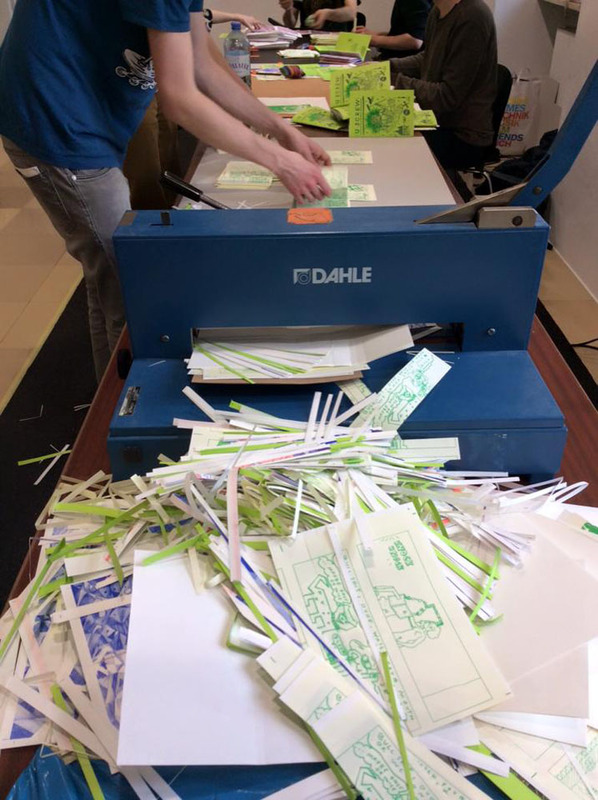 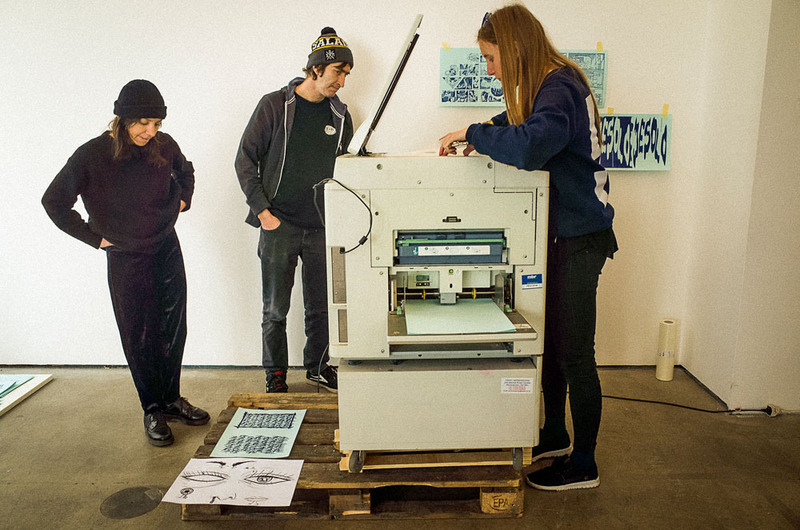 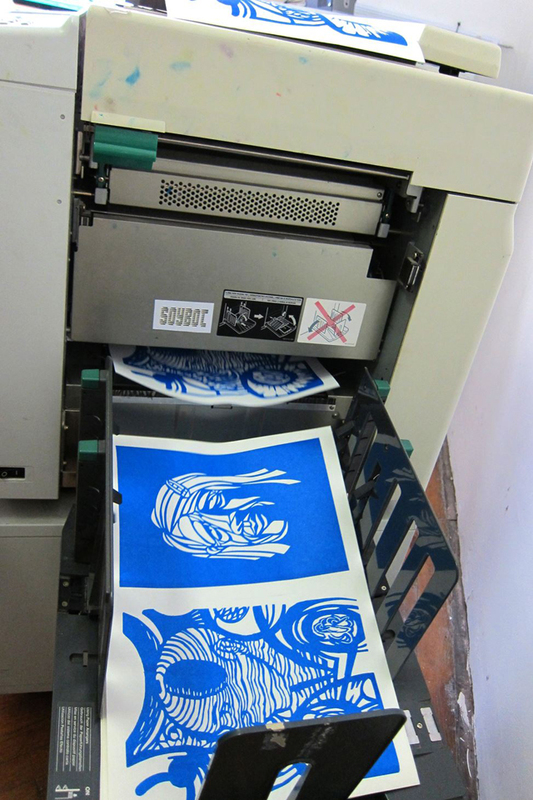 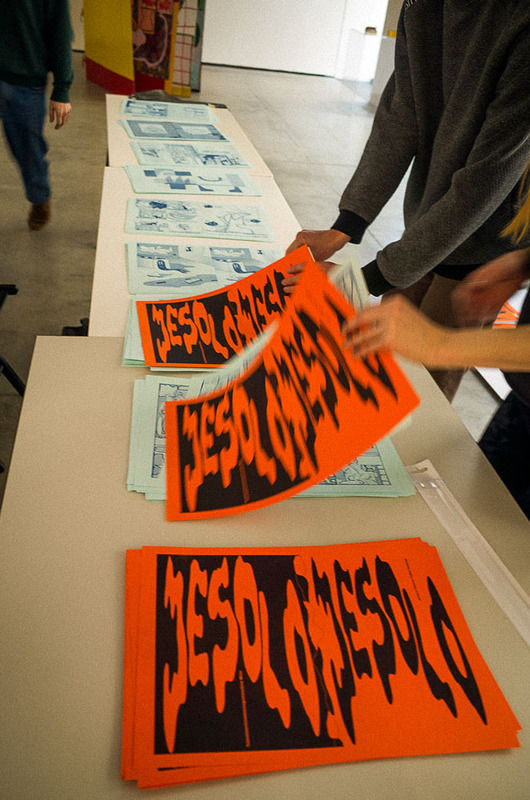 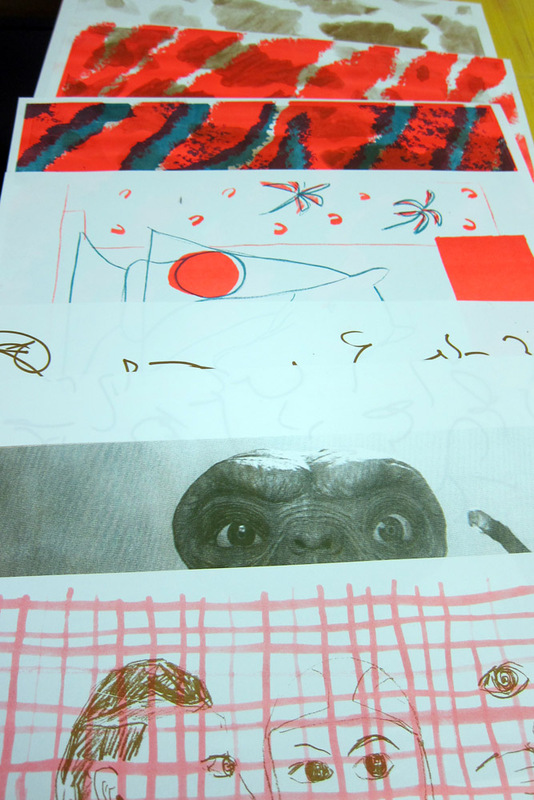 We are offering workshops from time to time, most of them are focused on a technical introduction to printing with a Risograph – in our case a Risograph GR3750, and creating a zine together with participants in a specific technique with one or 2 colors, or posters. 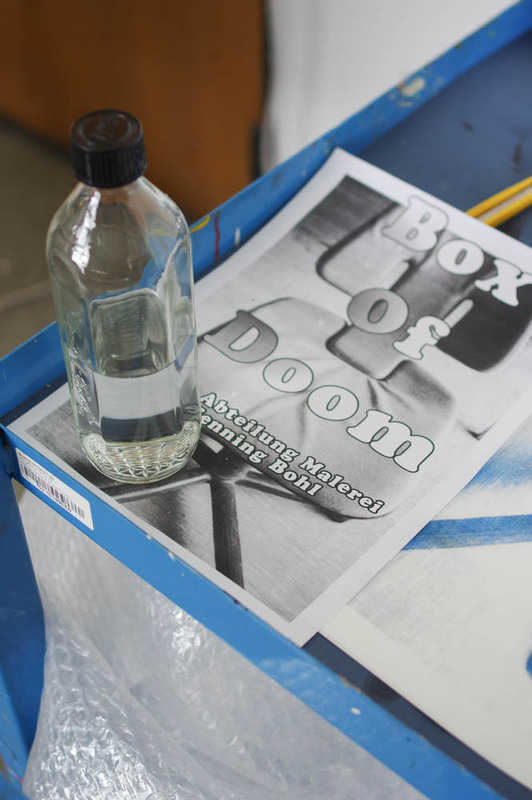 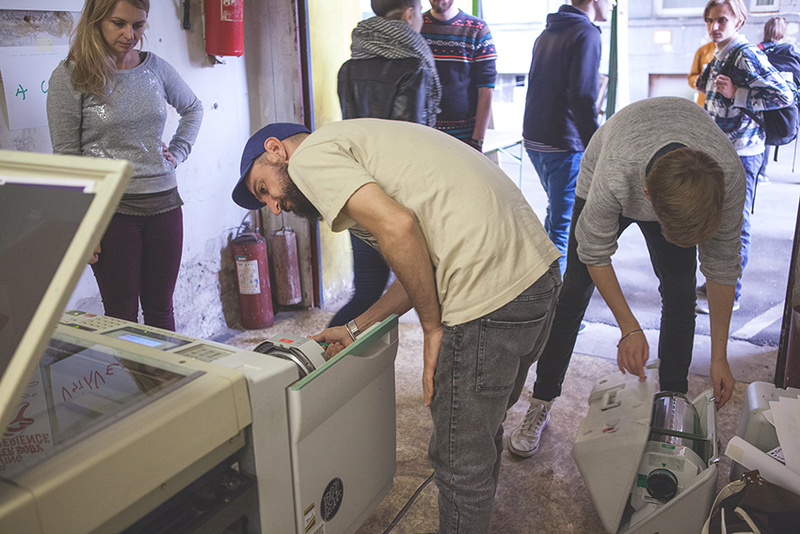 The result is always a small issue of prints/booklet that stay with the participants and organizers, while 10 copies go to our SOYBOT archive. 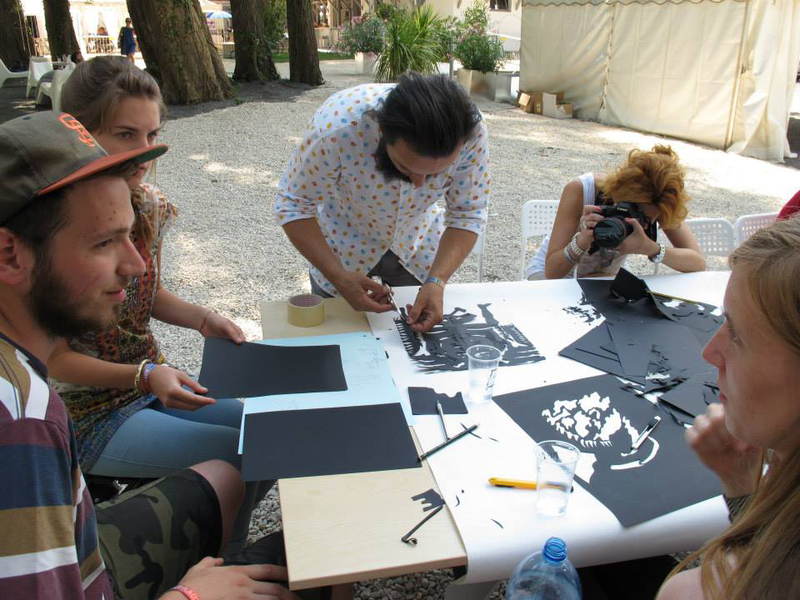 Jesolo was produced during this workshop. 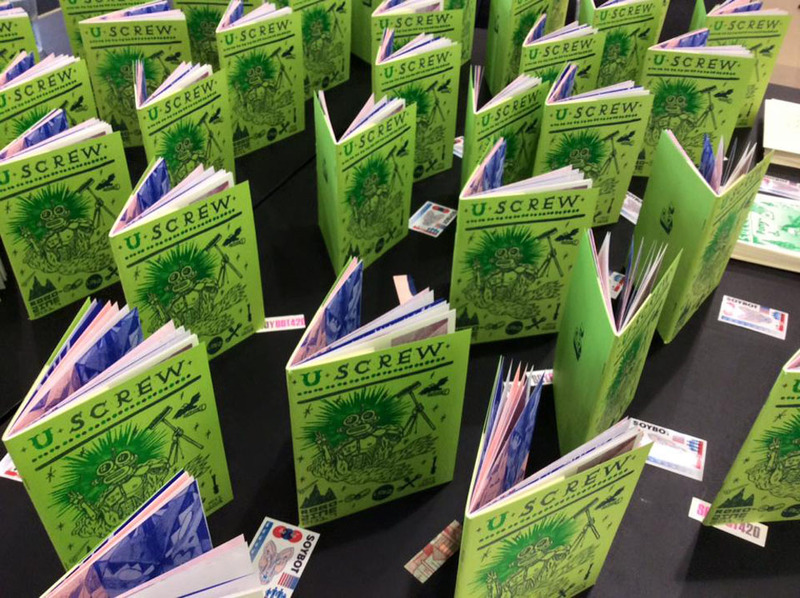 UScrew was produced during this workshop. 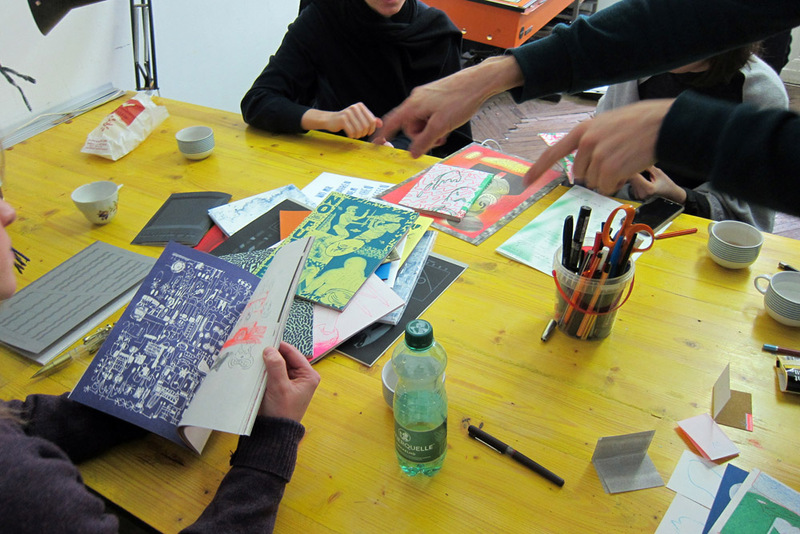 World Book Day is a great occasion for a workshop. 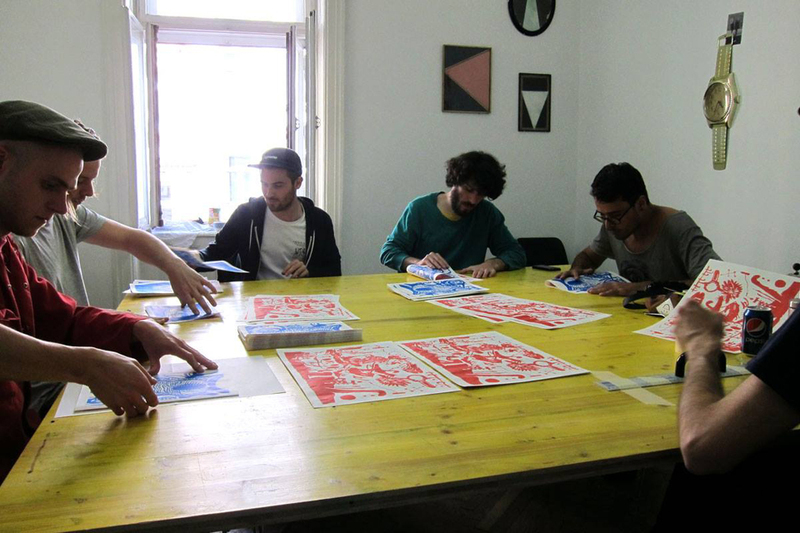 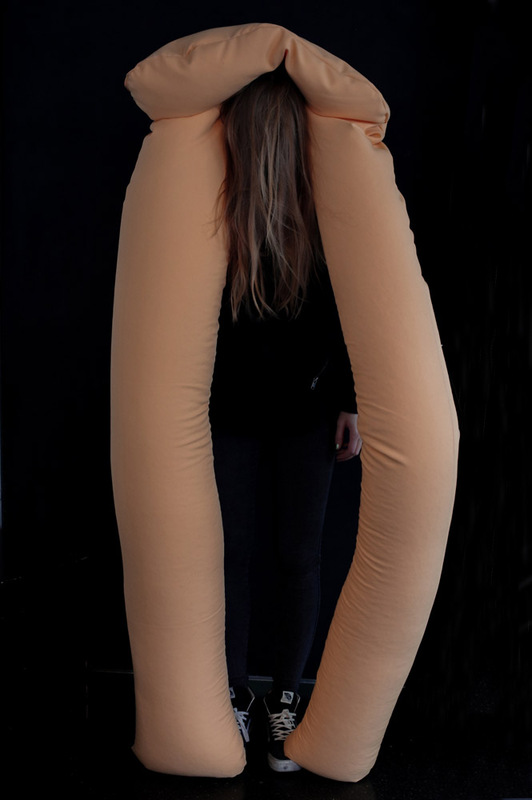 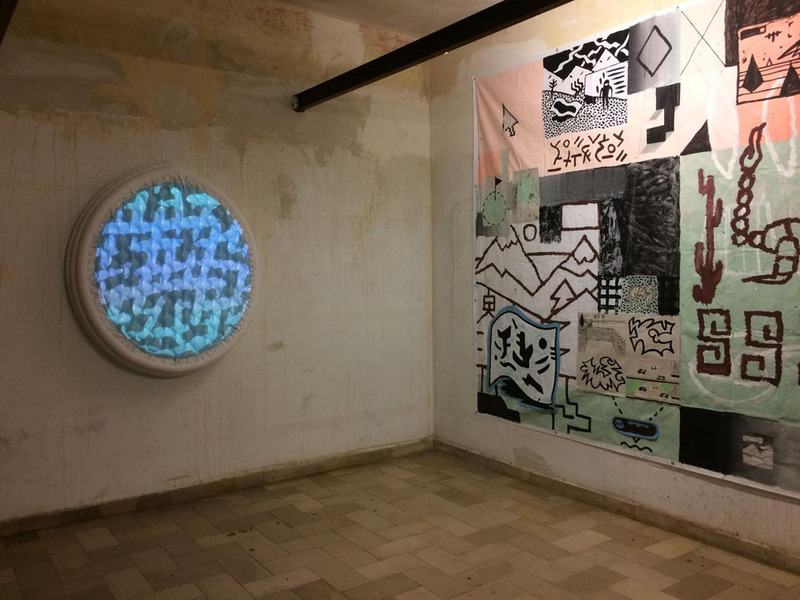 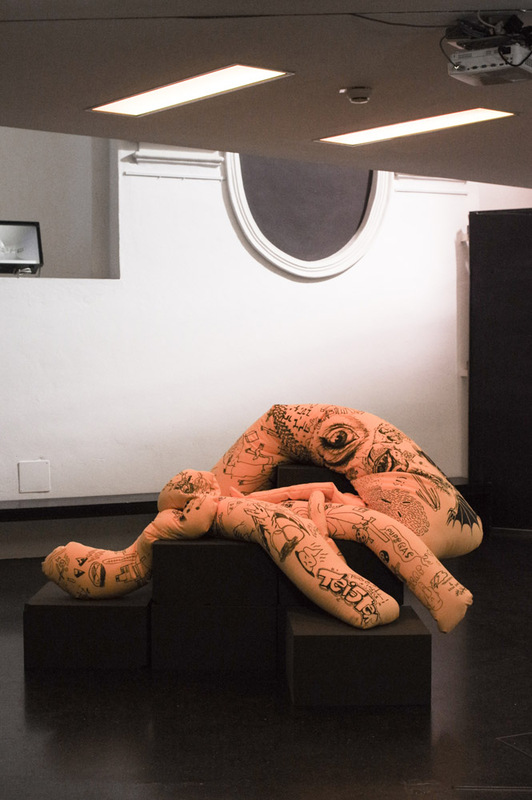 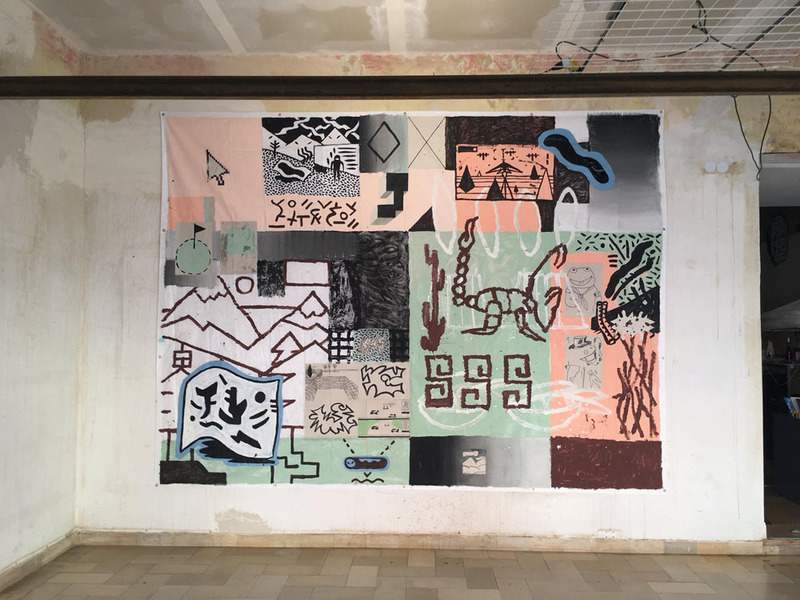 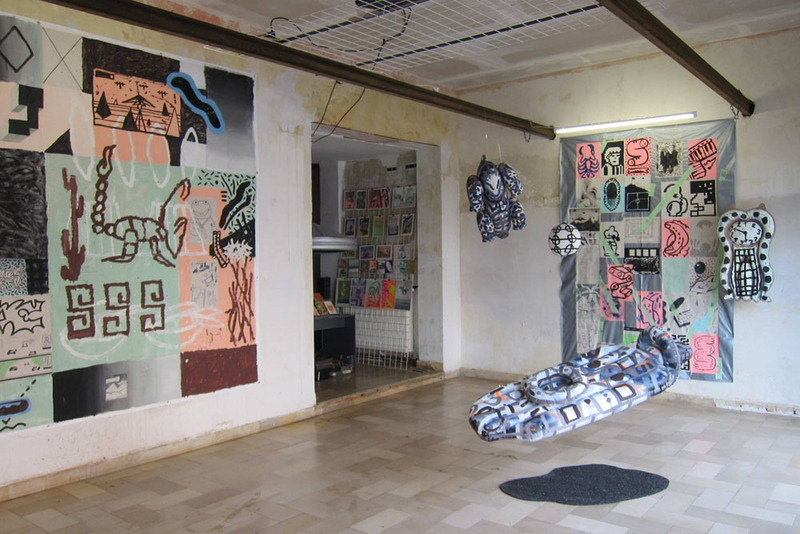 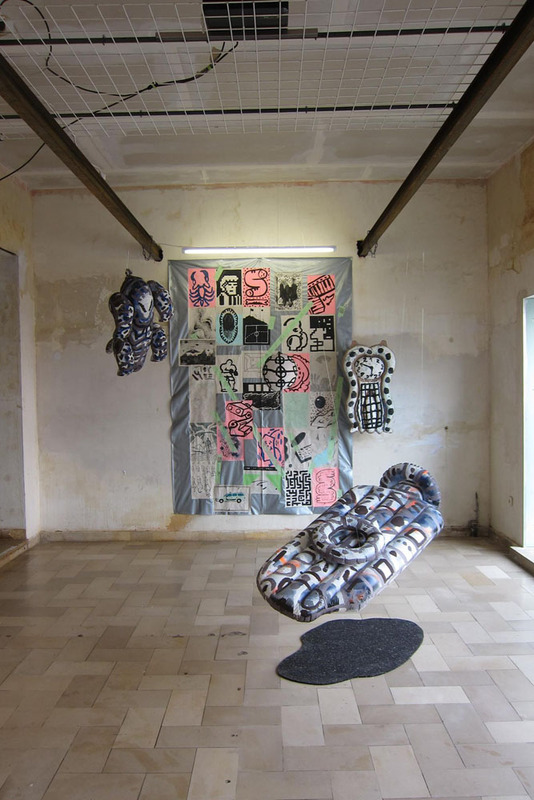 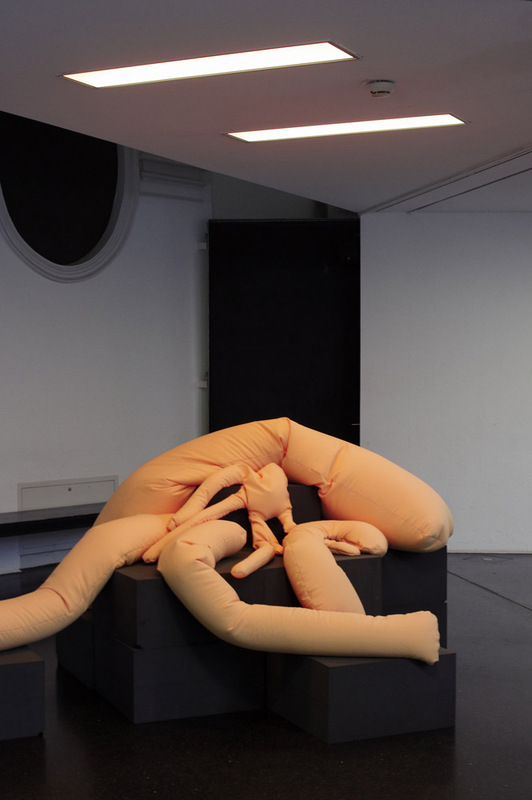 Thanks to Salon für Kunstbuch and 21er Haus! 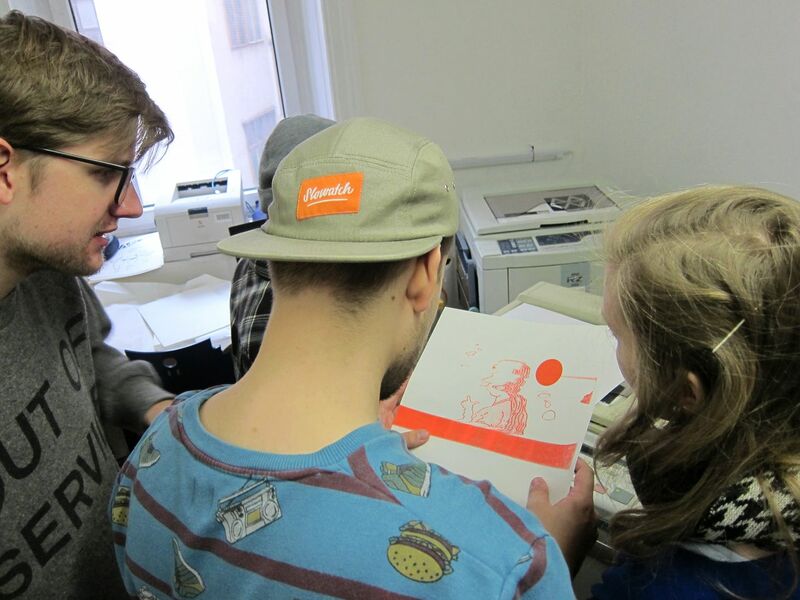 This time students and assistants of painting class payed us a visit at our studio and we showed them some secret RISO tricks for their own projects—great output and experiments, looking forward to see their future work at university! 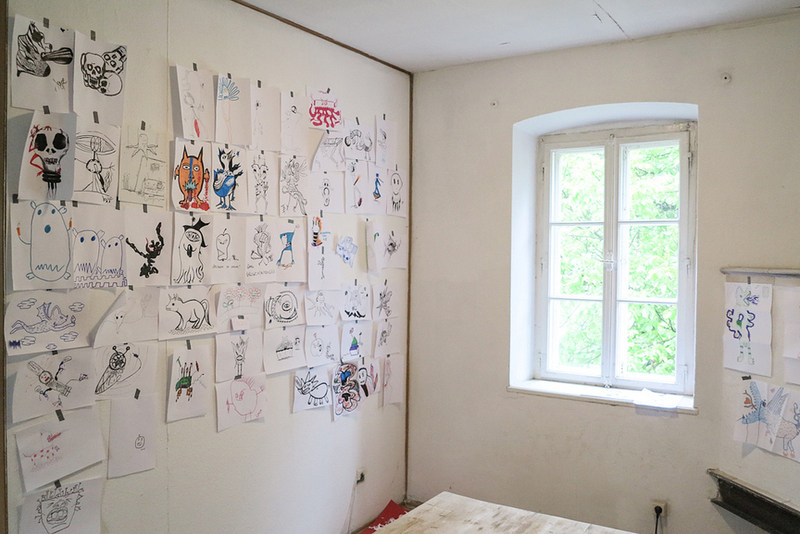 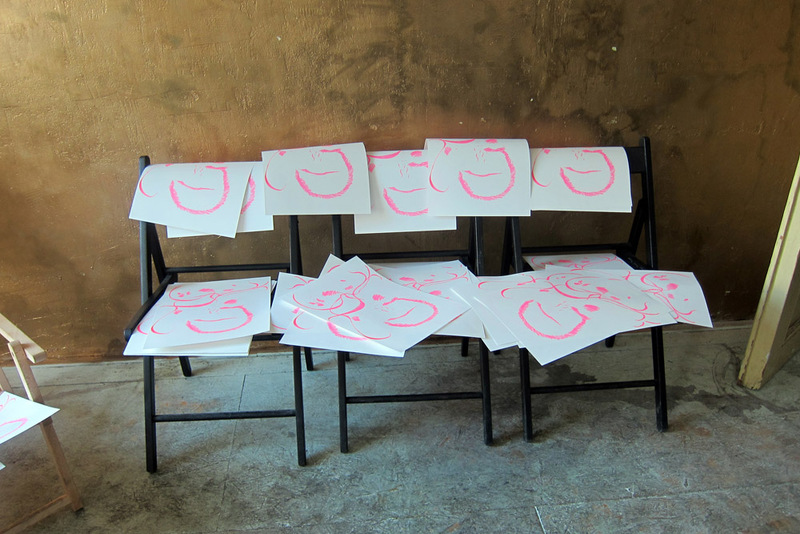 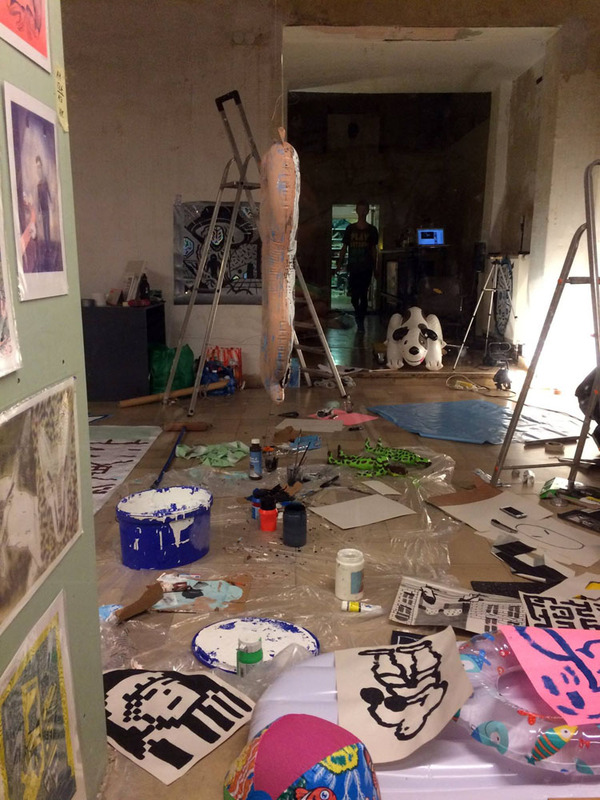 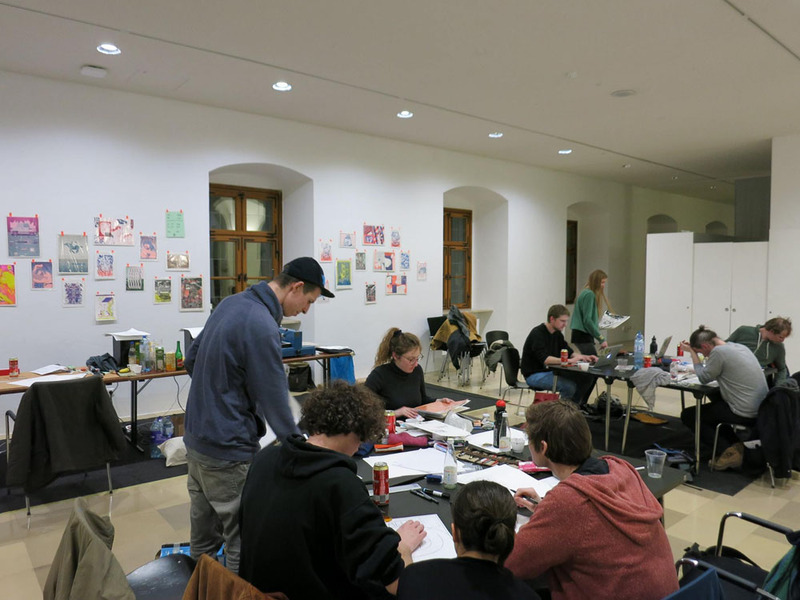 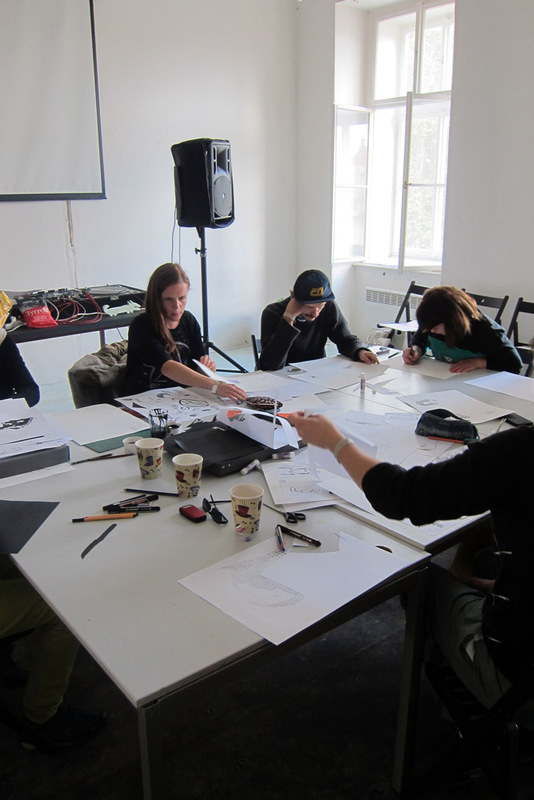 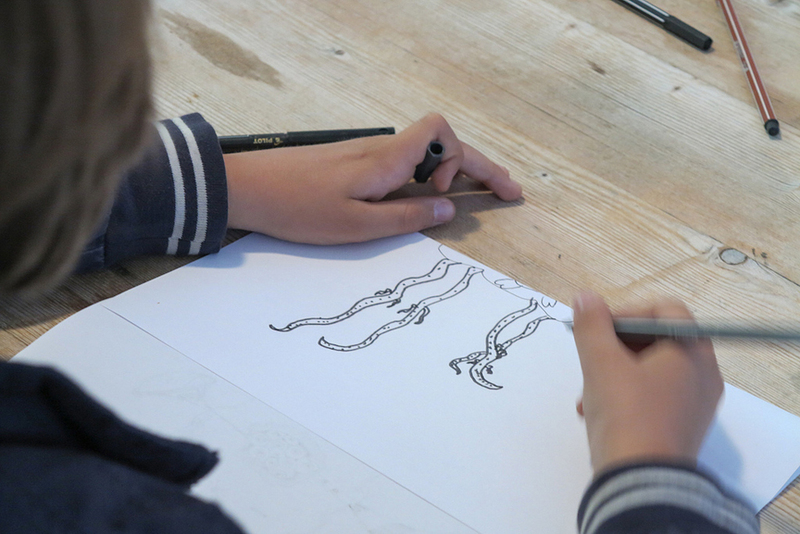 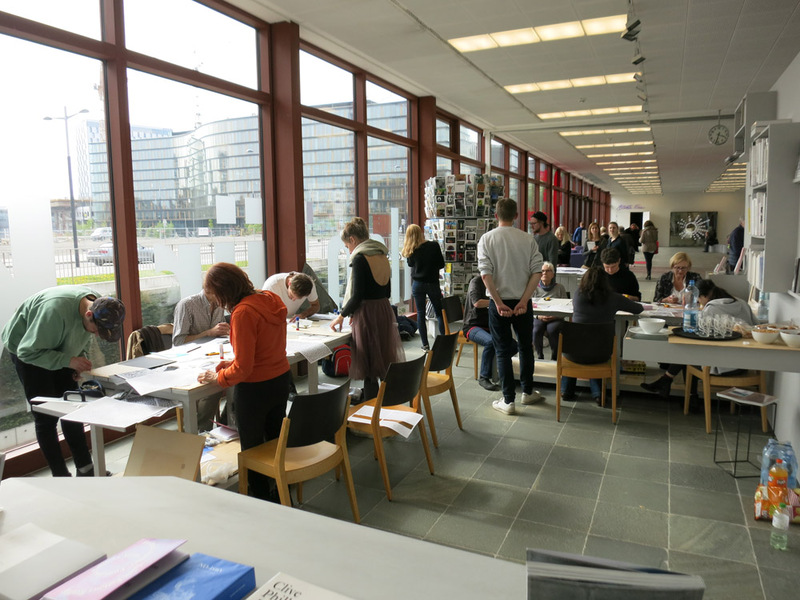 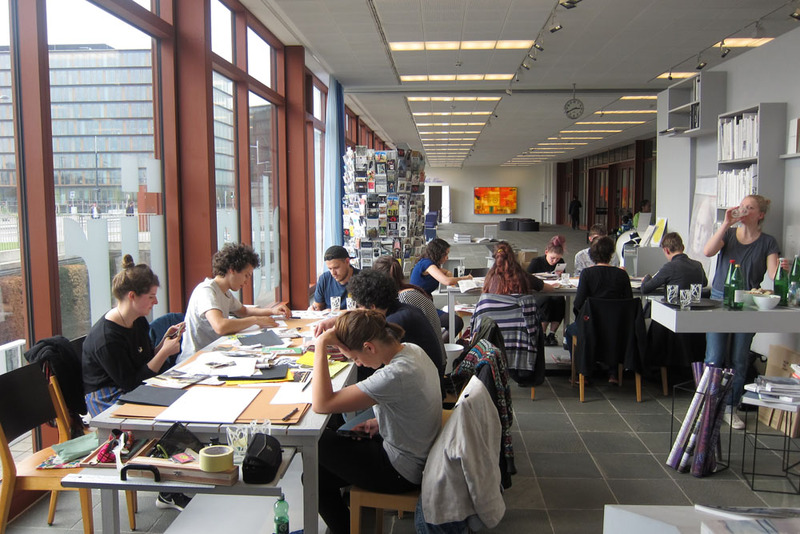 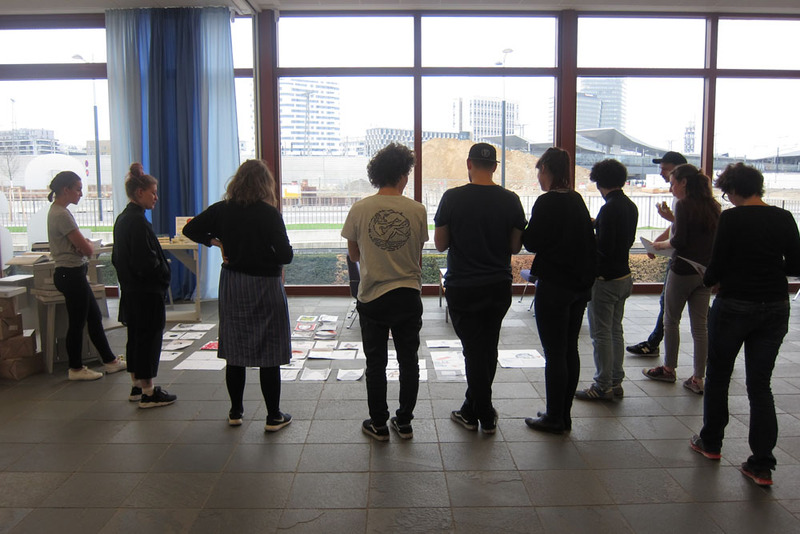 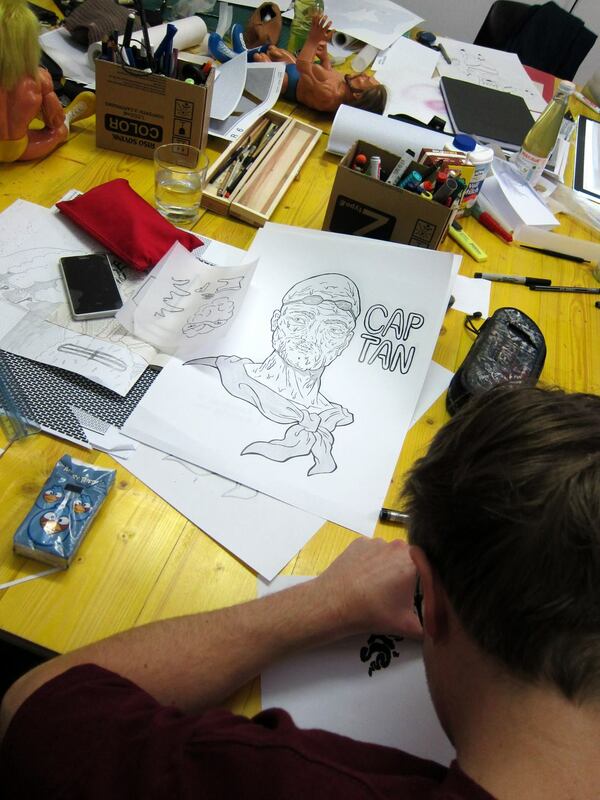 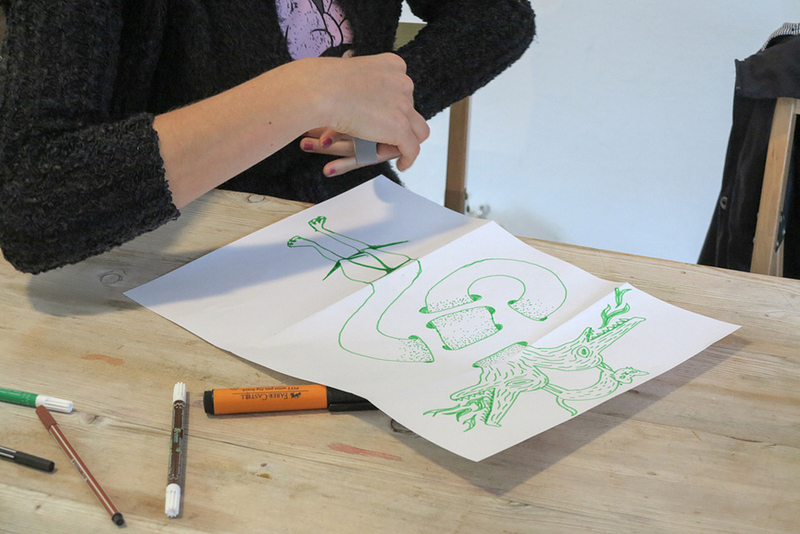 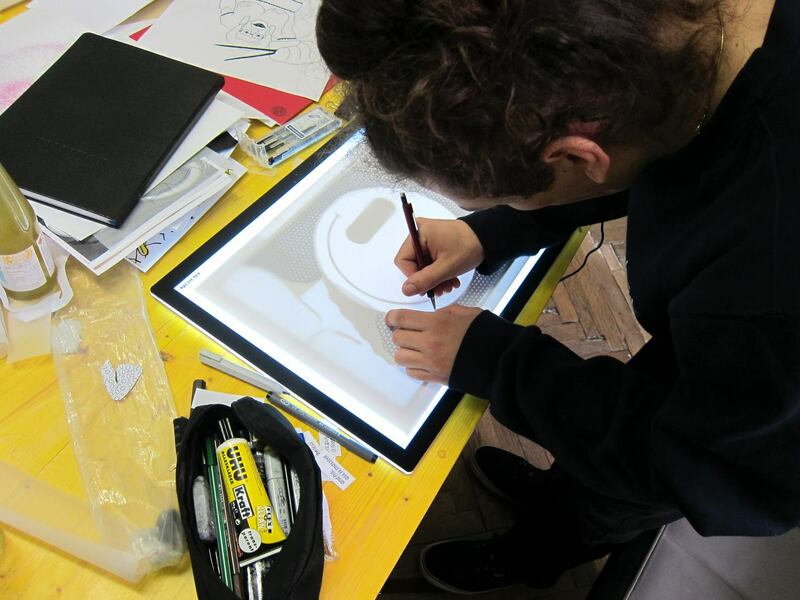 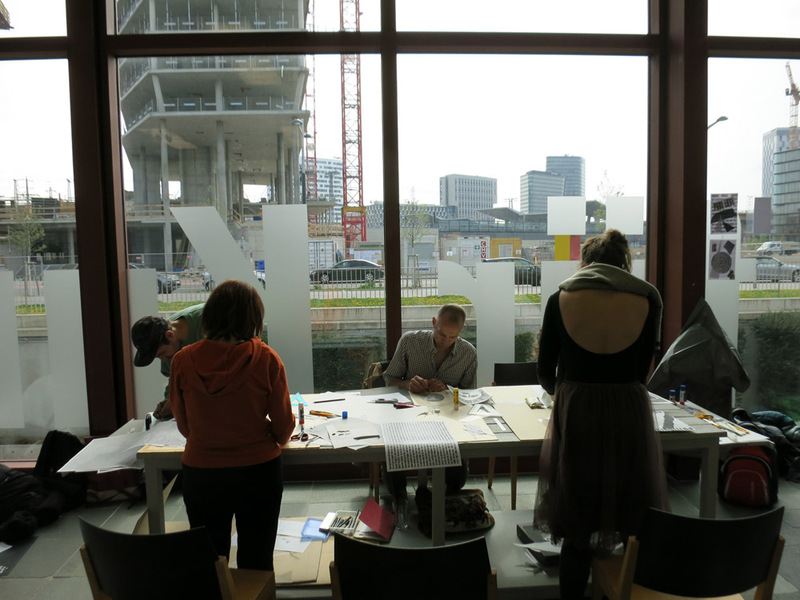 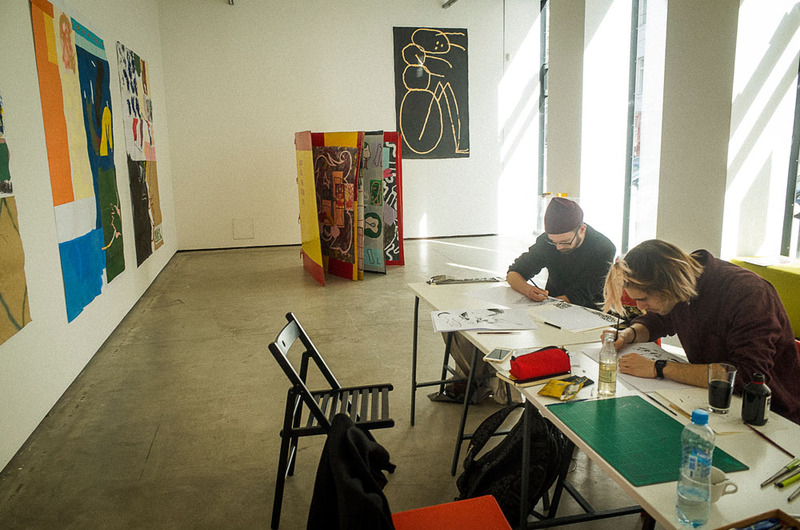 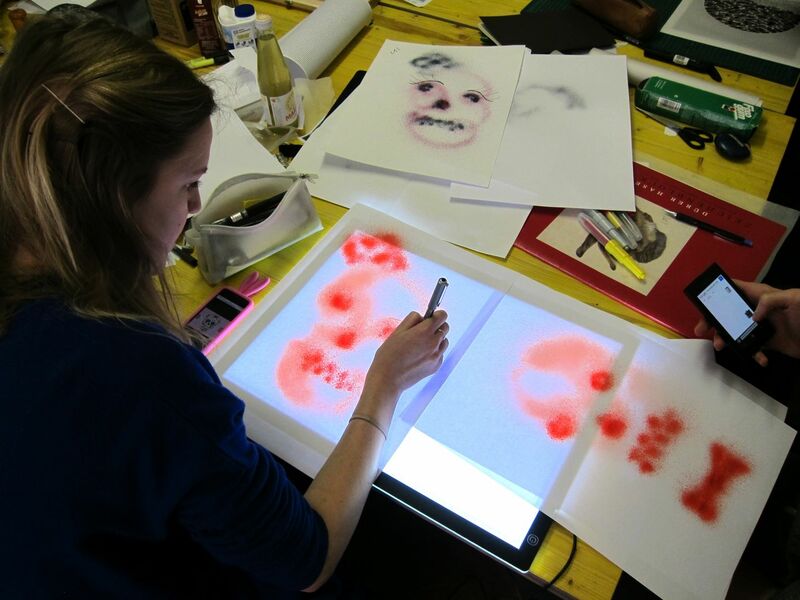 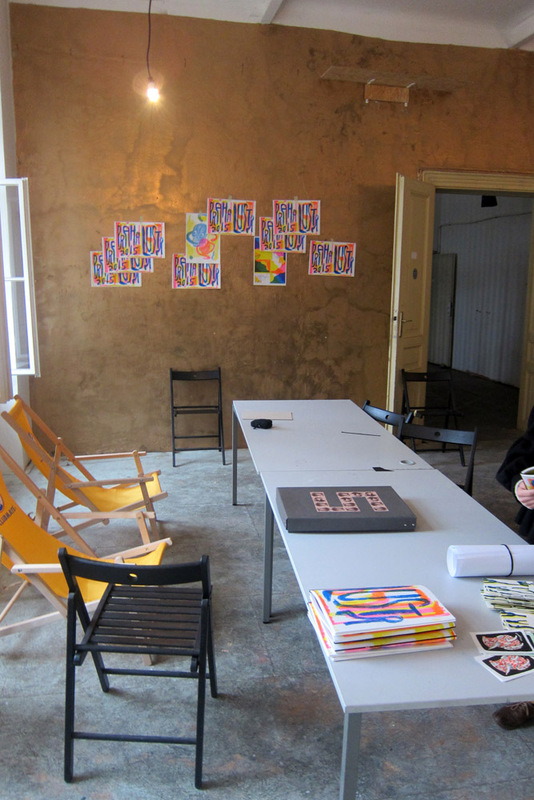 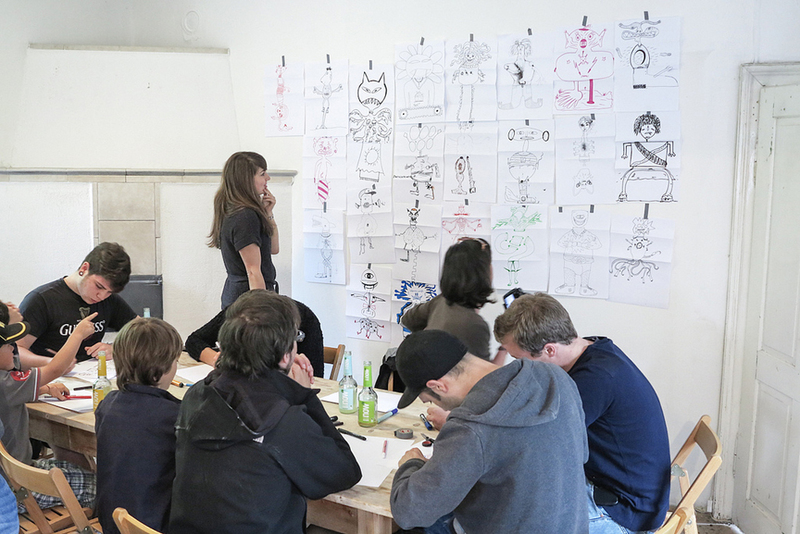 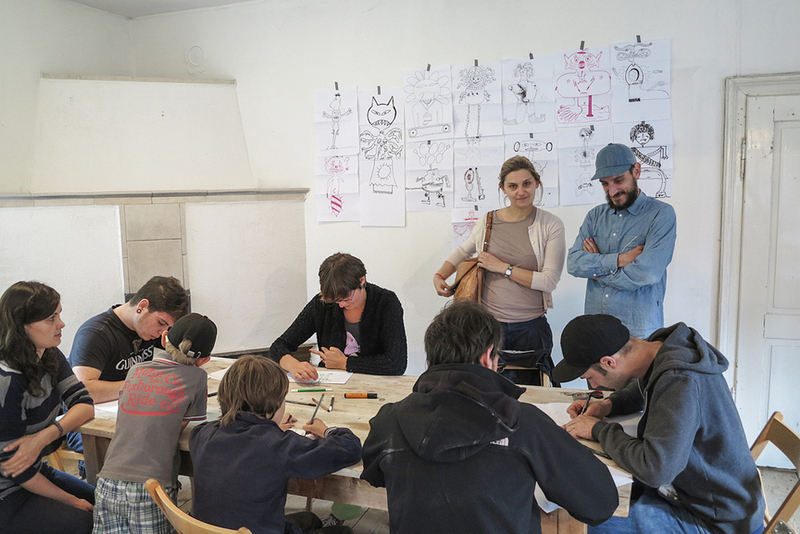 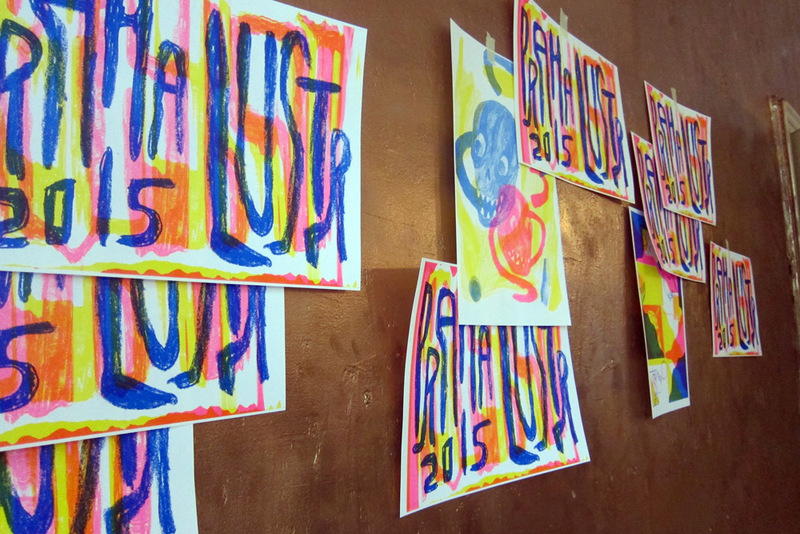 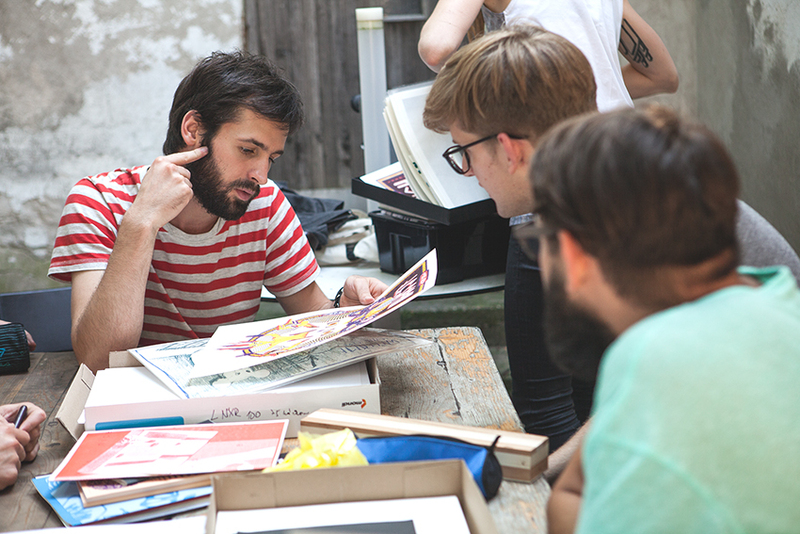 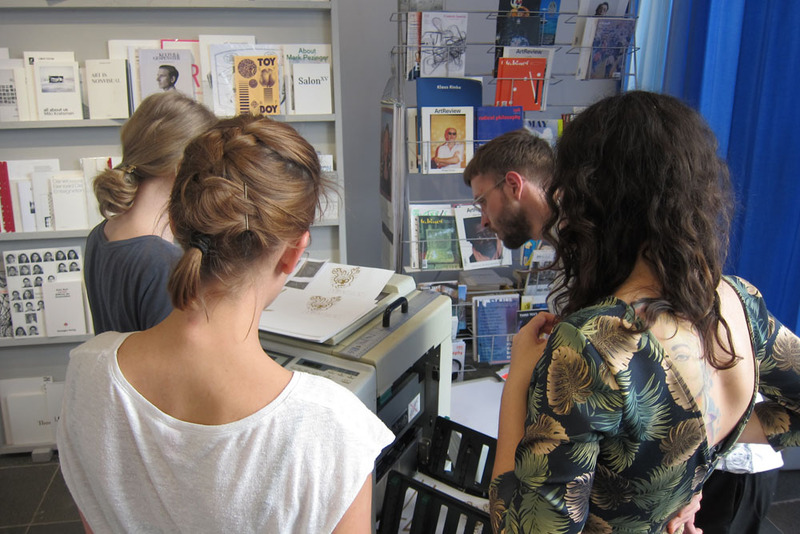 On World Book and Copyright Day we held a workshop at the Salon für Kunstbuch / 21er Haus. 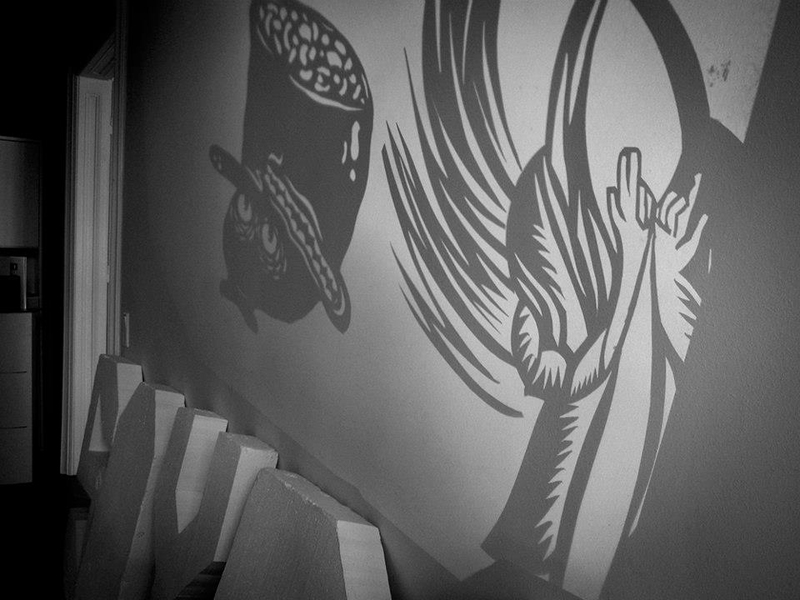 Thanks for sharing the weekend with us, it was great! 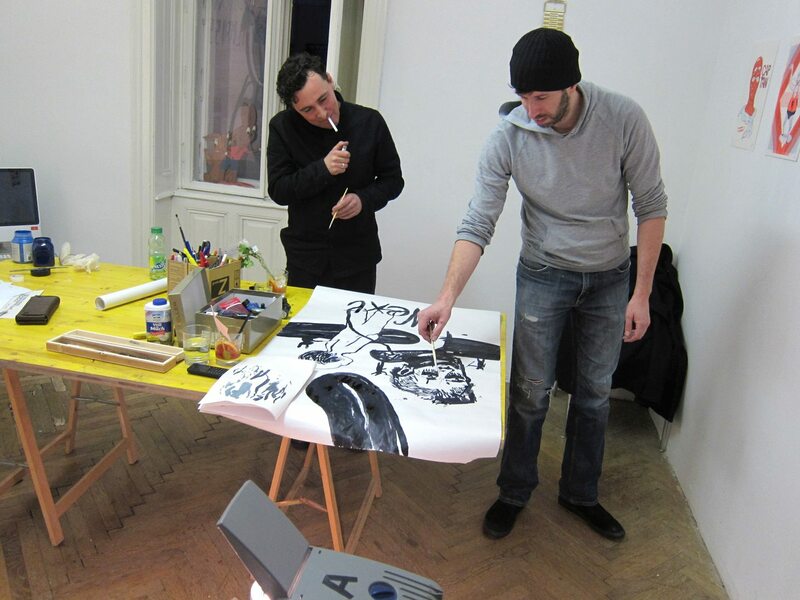 Ohne Fett und ohne Creme, ein dermographisches Spektakel! 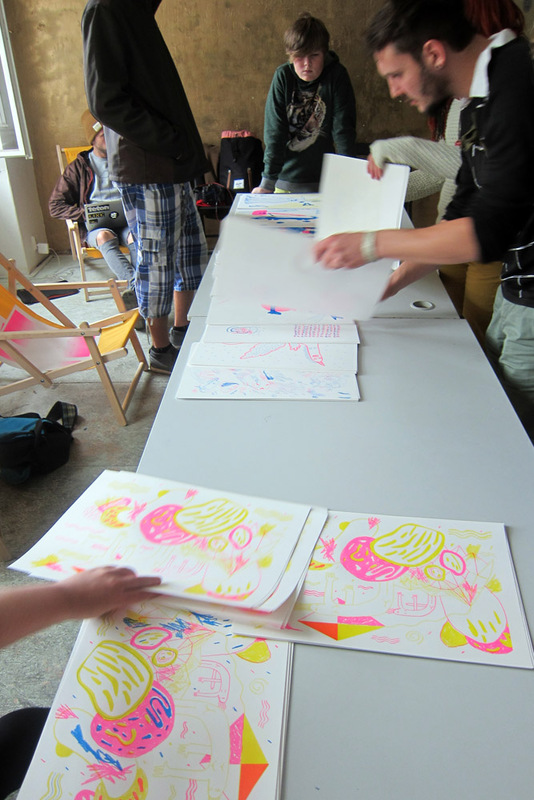 Had a great time at LUSTR-Festival working on a poster-zine with a RP machine and fluo-pink, took us 2 days, had a lot of fun! 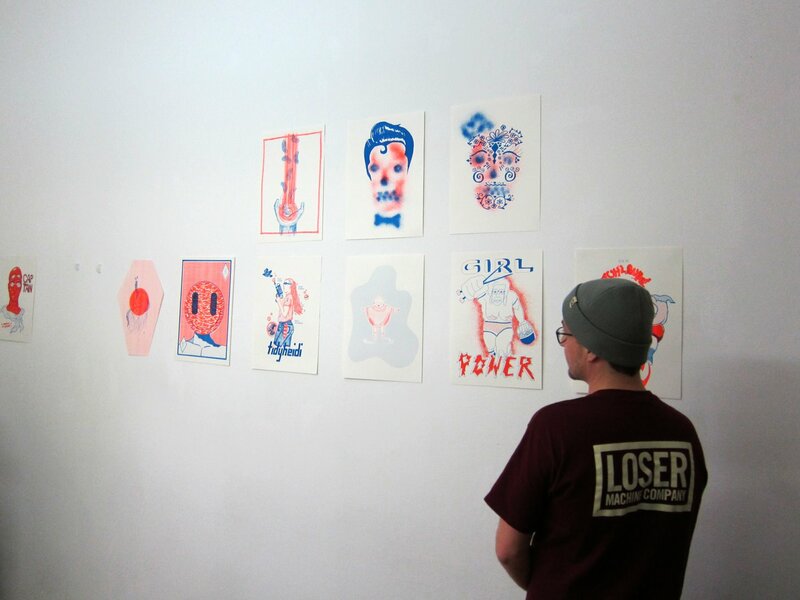 Thanks to page5 & kudla! 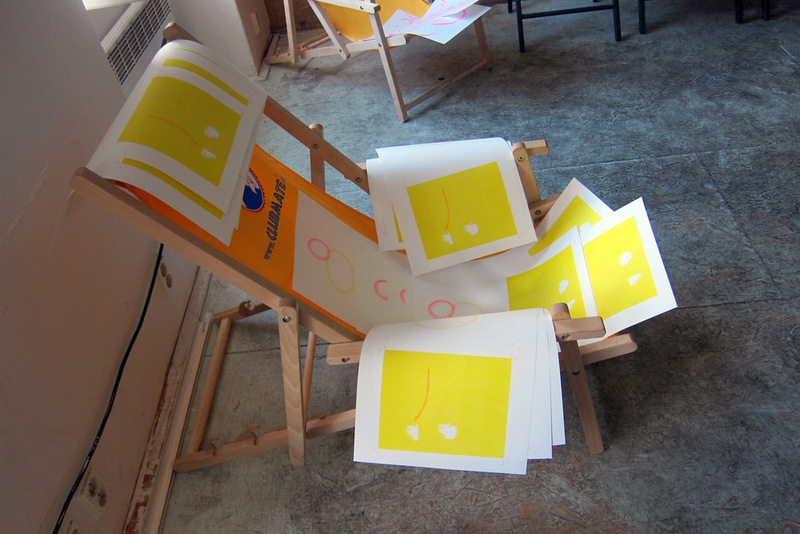 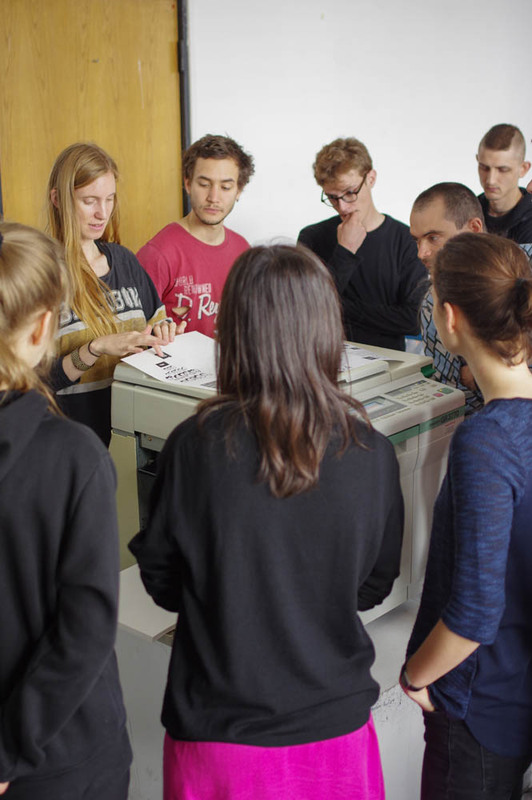 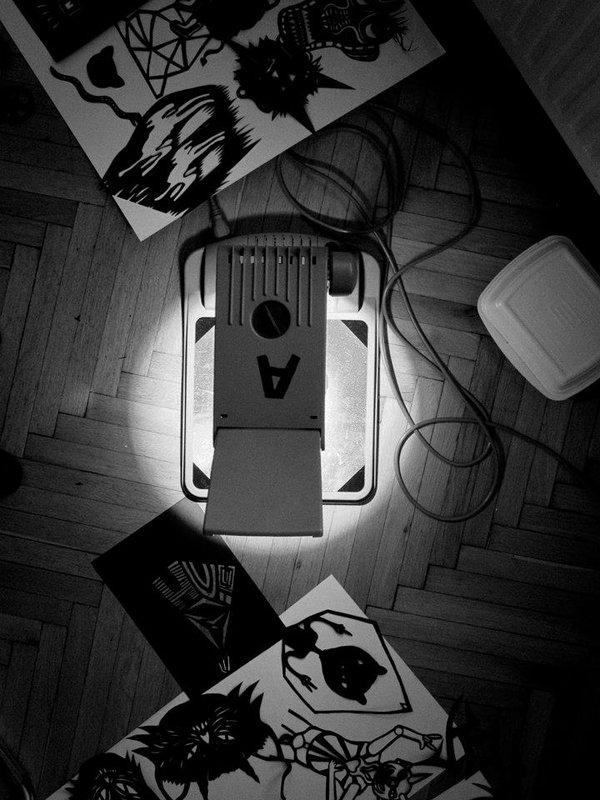 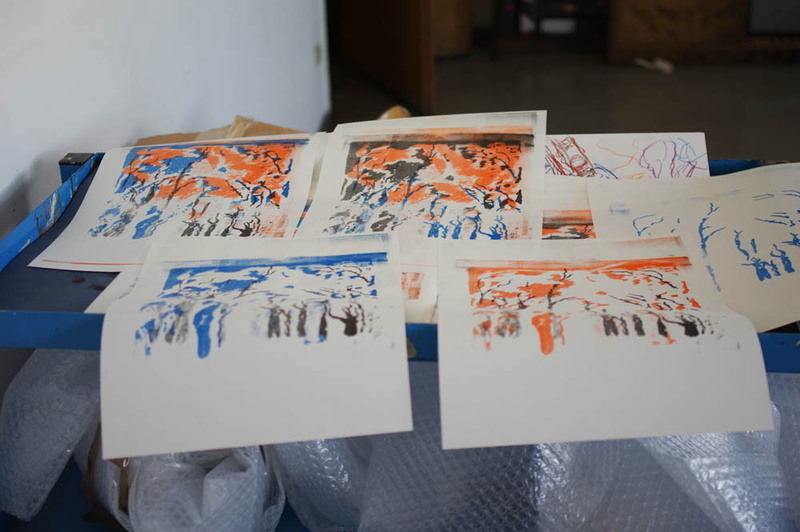 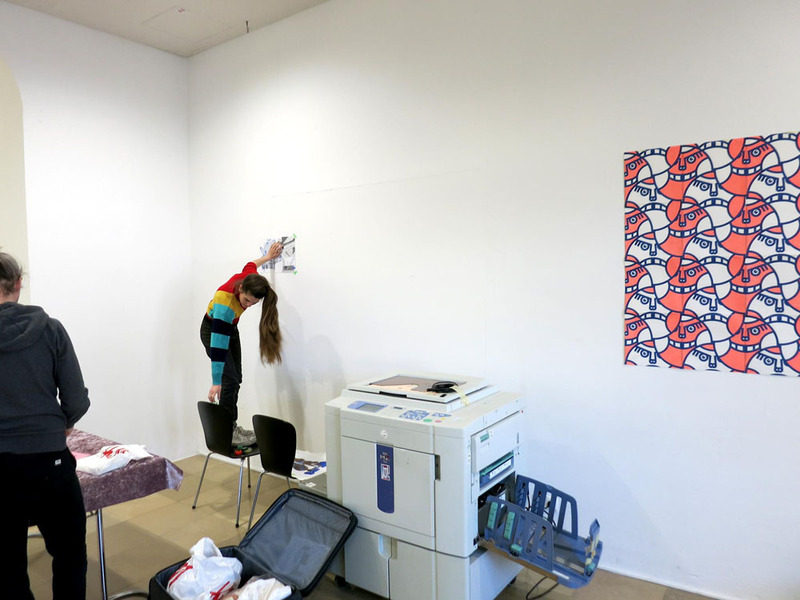 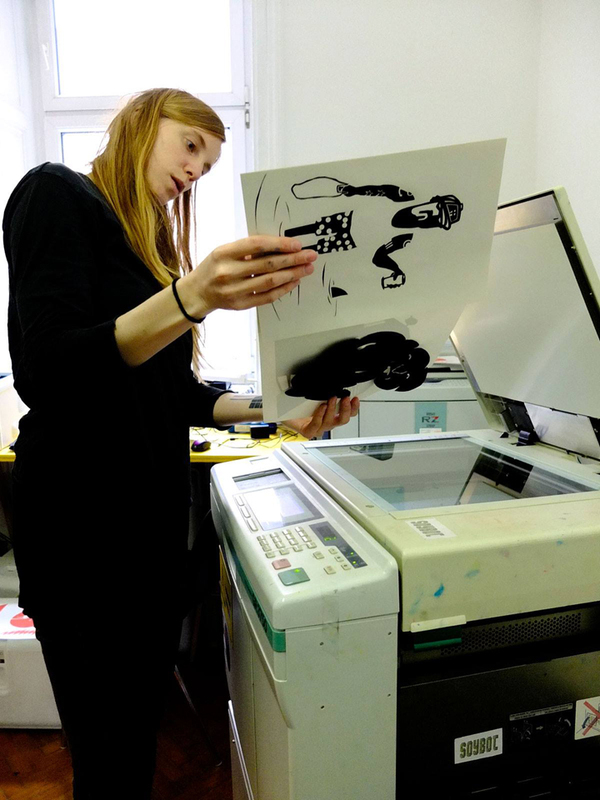 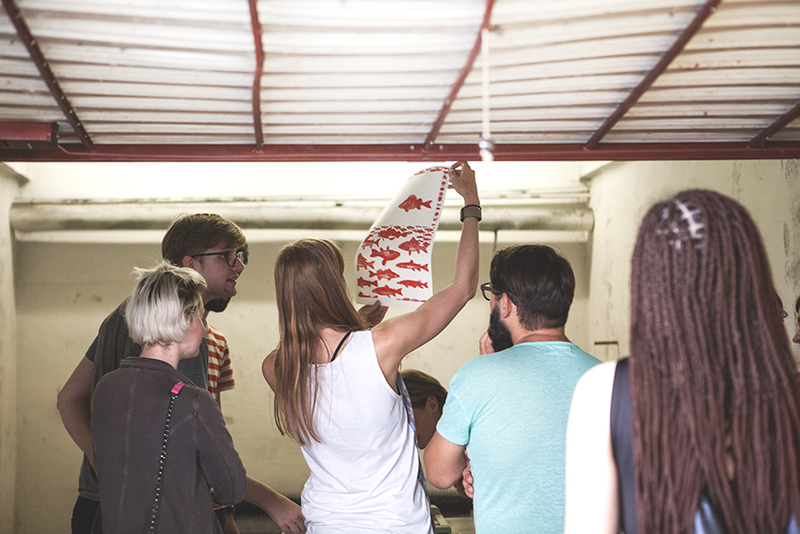 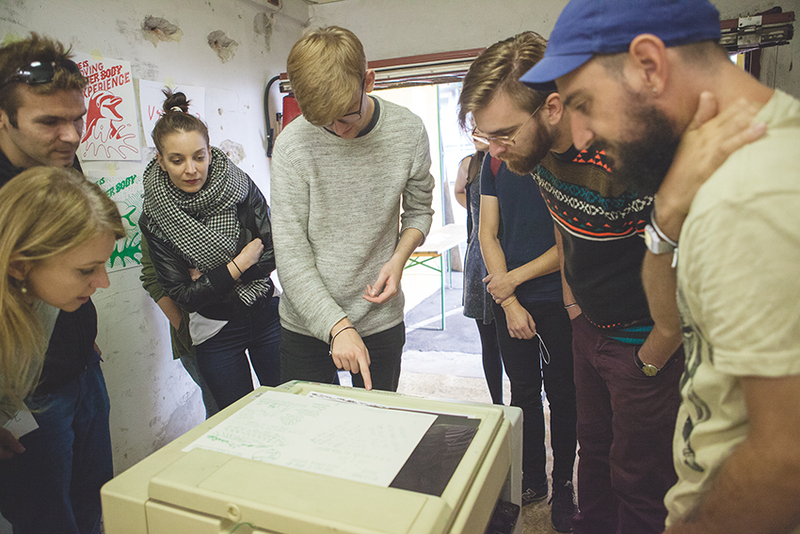 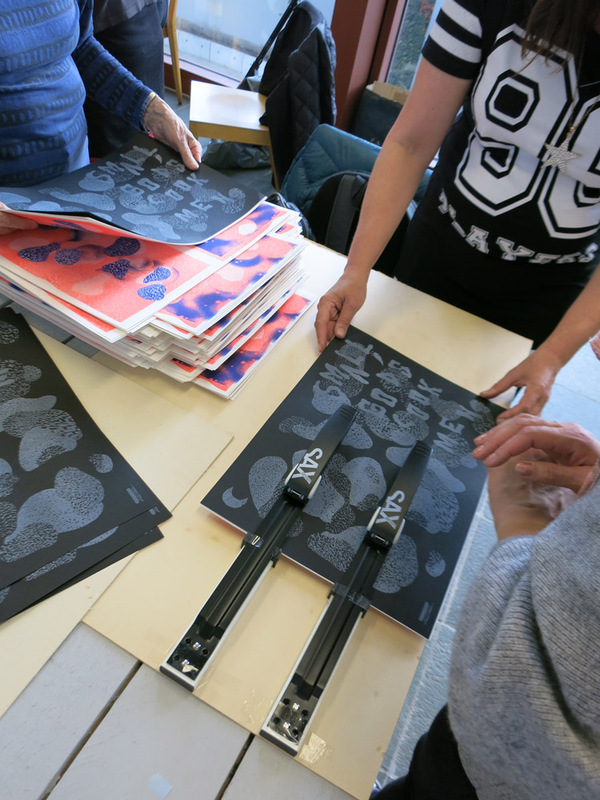 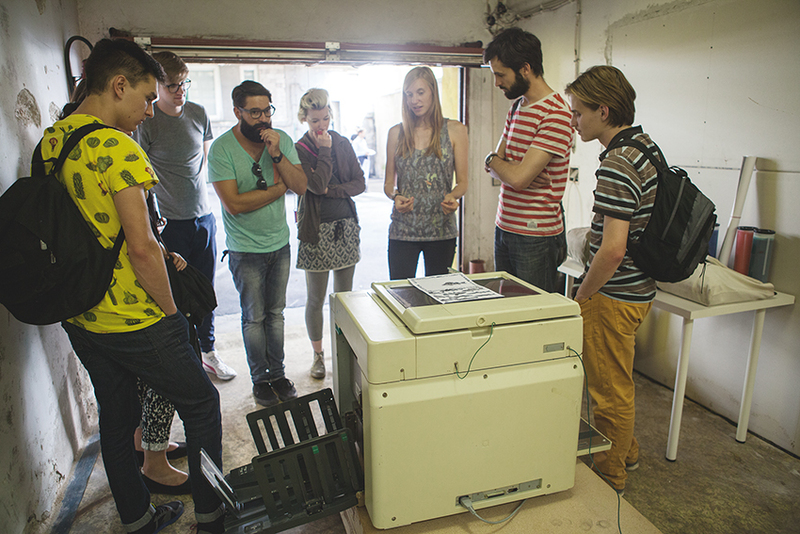 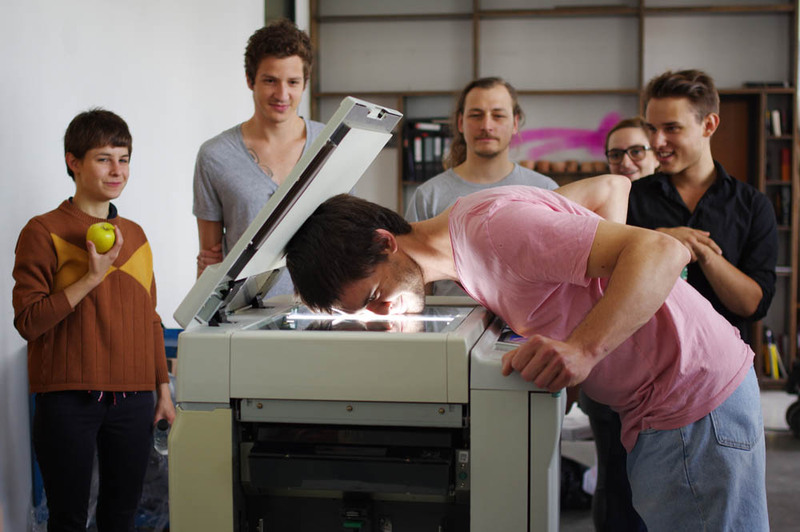 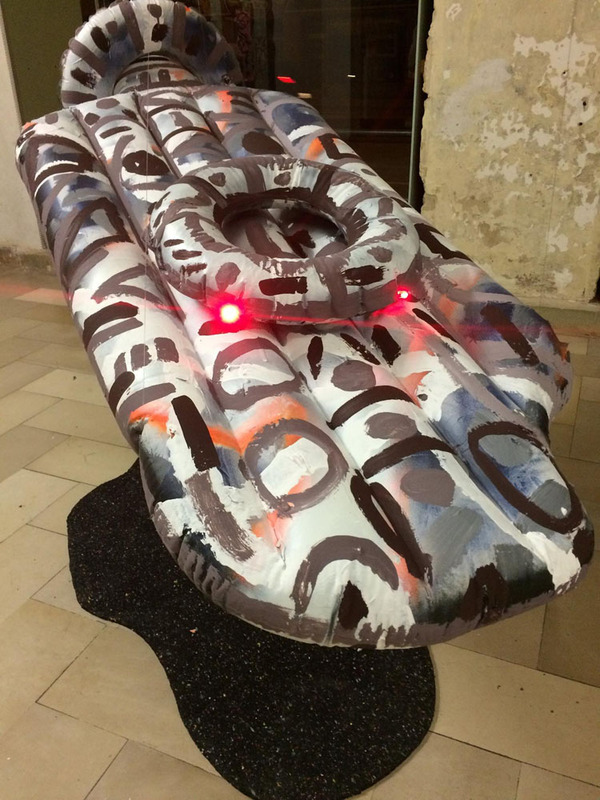 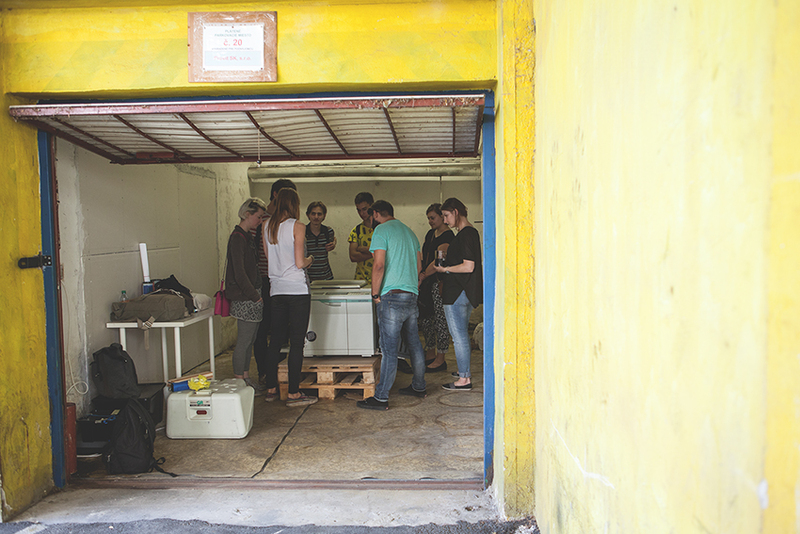 The painting class at the University of Applied Arts Vienna received a new attraction: A Risograph GR3770 – SOYBOT held an induction workshop about the accurate handling of this nice machine, no taboos, tons of special test prints, some demolishing and screwing too! 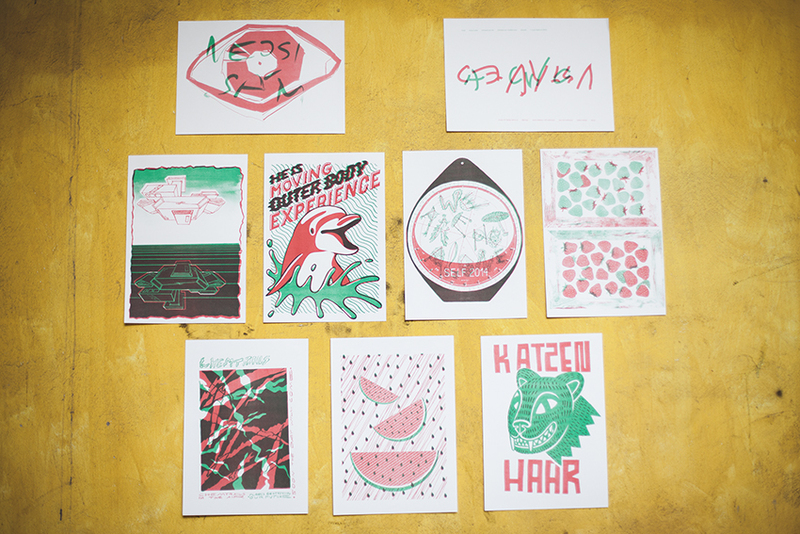 «Show us the laziest, weirdest, weakest, saddest Super Anti Heroes you can imagine!» Through the help of our risograph’s super powers we printed quite amazing posters. 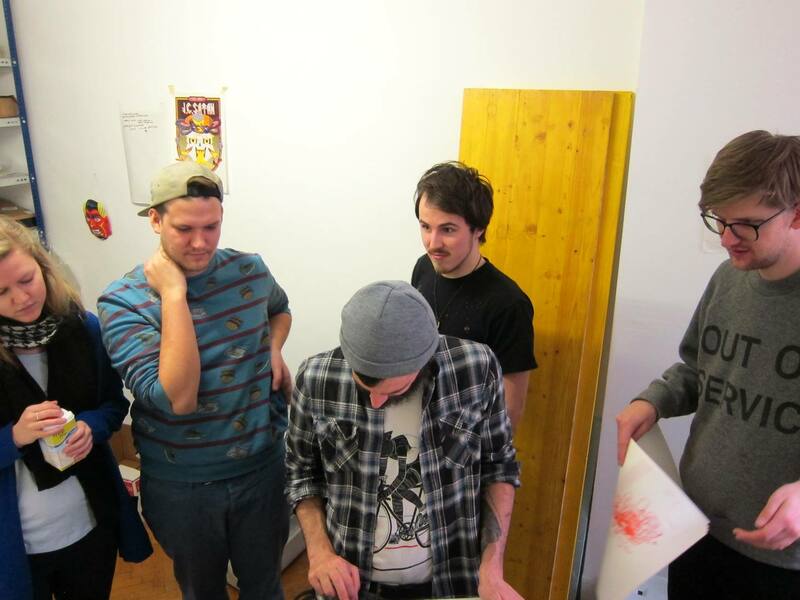 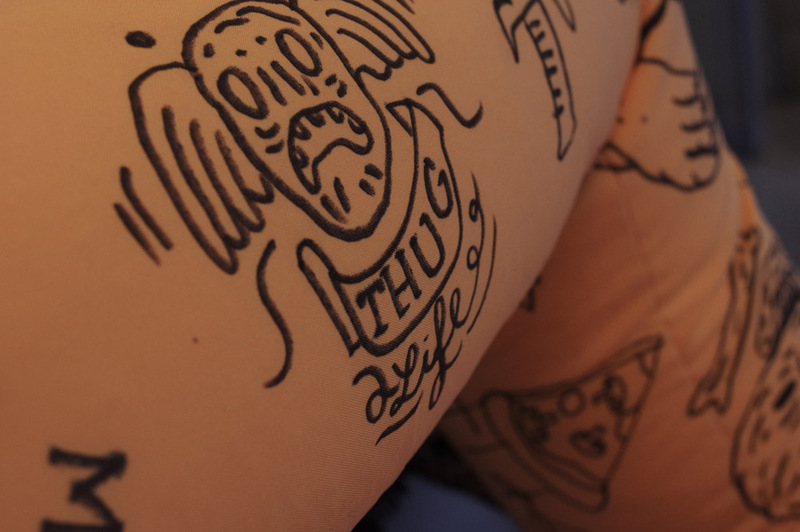 Special thanks to Simon Häussle and Stefano Ricci for coming by, talking about their work and hanging out! 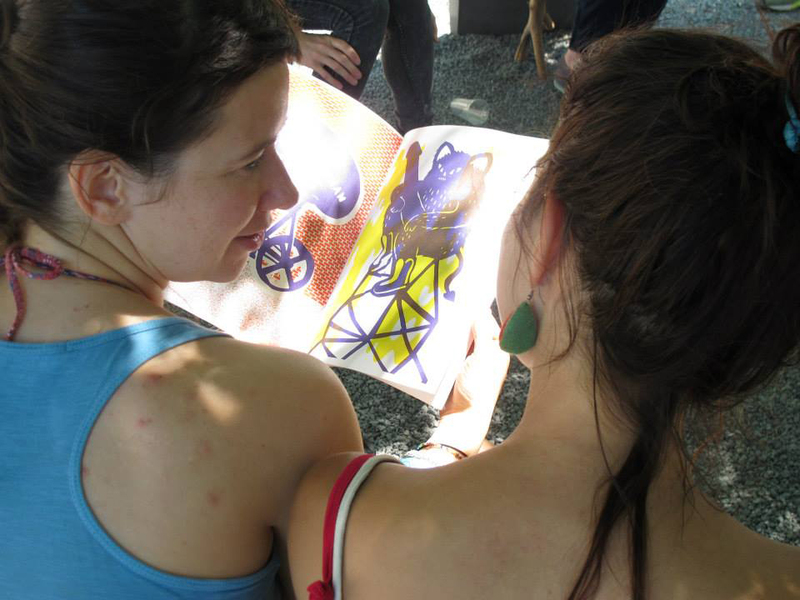 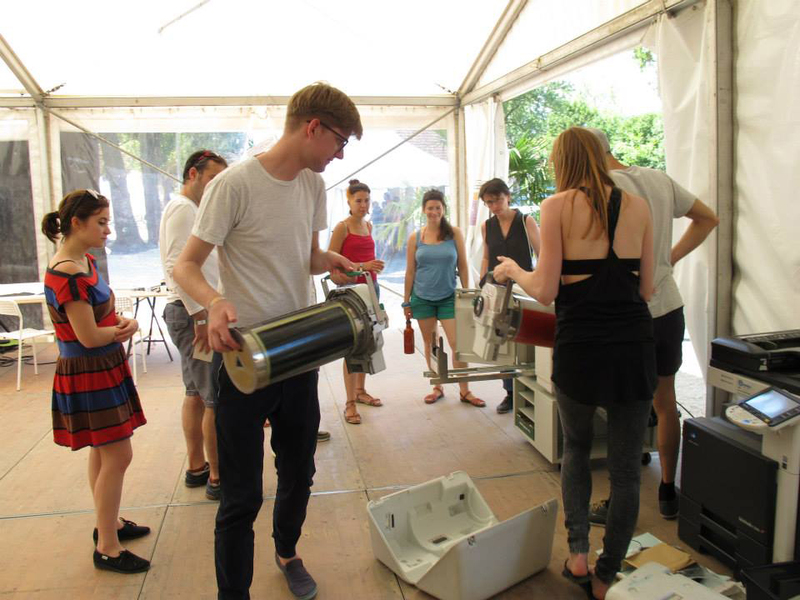 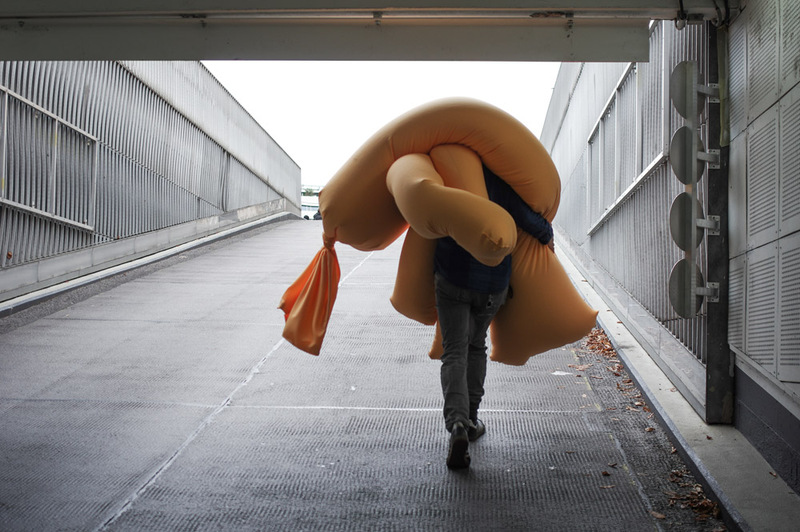 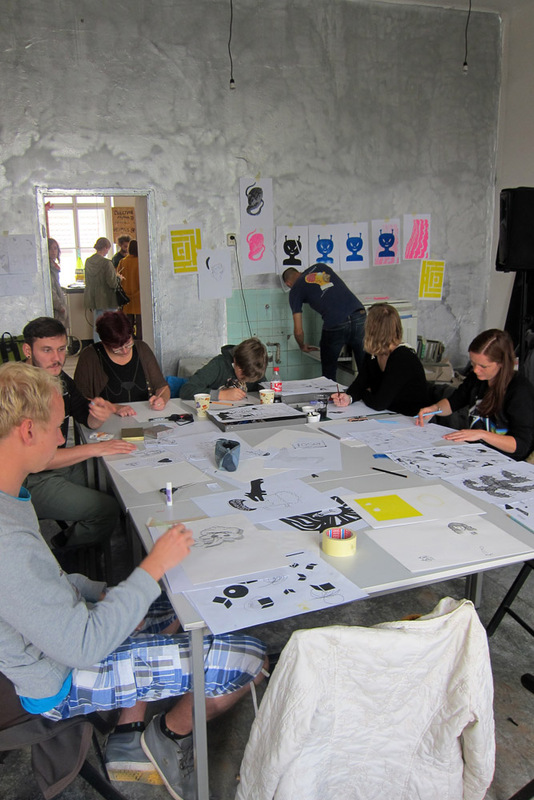 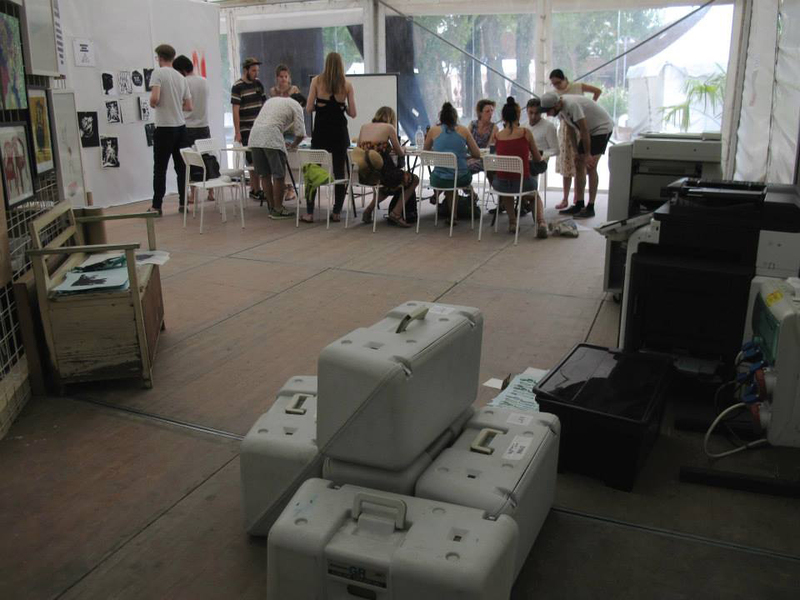 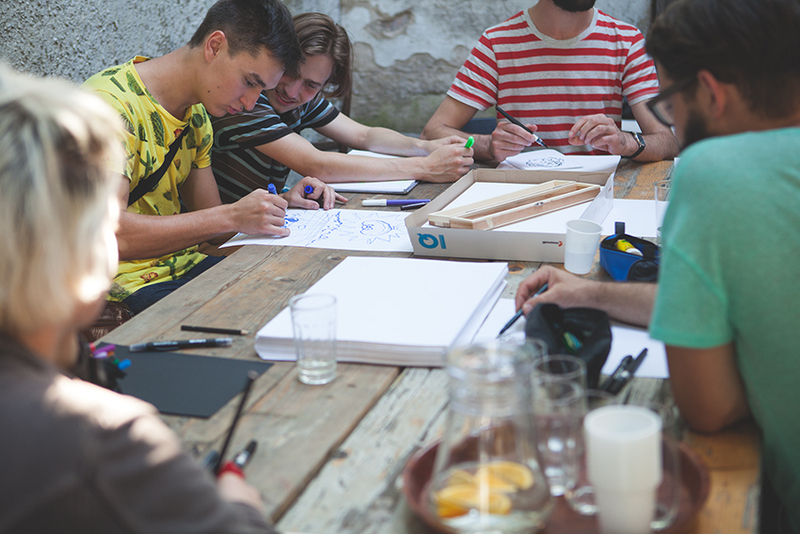 The lovely people from the SELF-Festival invited us to do a workshop in Bratislava. 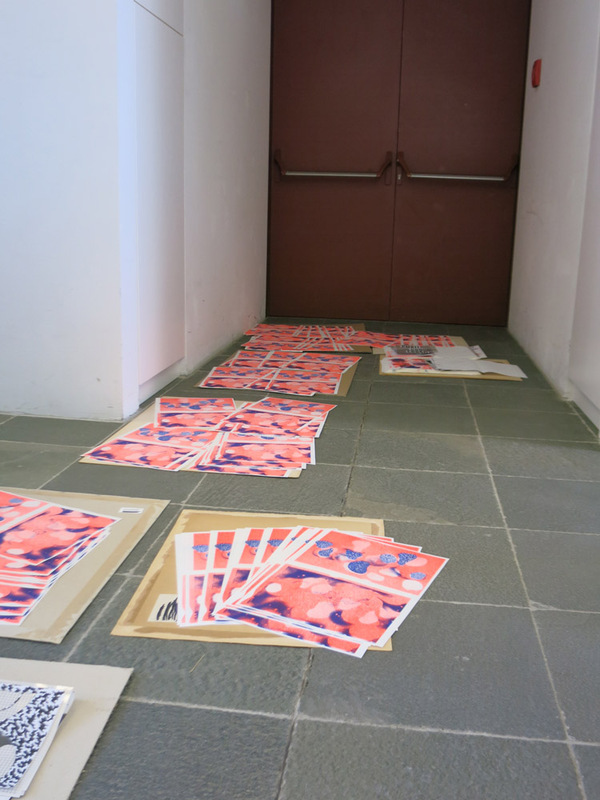 During two days we produced a small collection of two coloured posters. 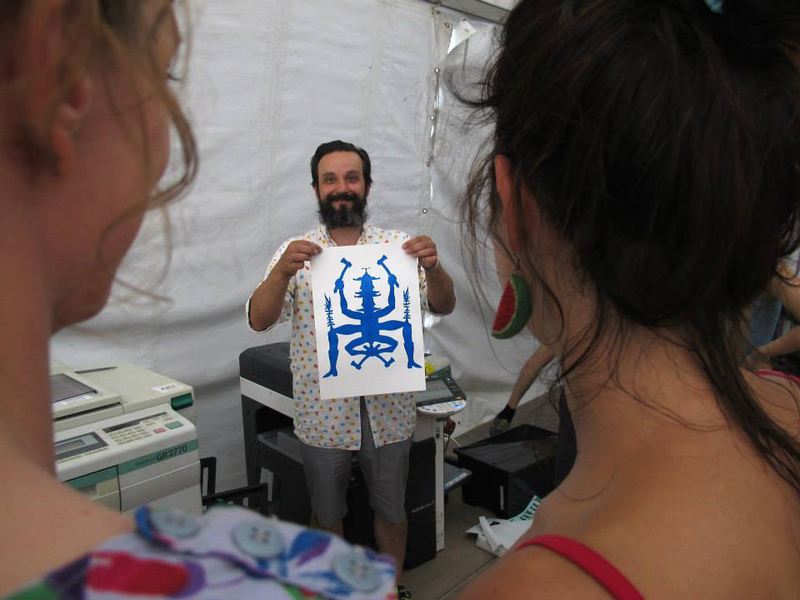 The title of this years festival was "NIE SME TU SAMI" – "We are not alone". 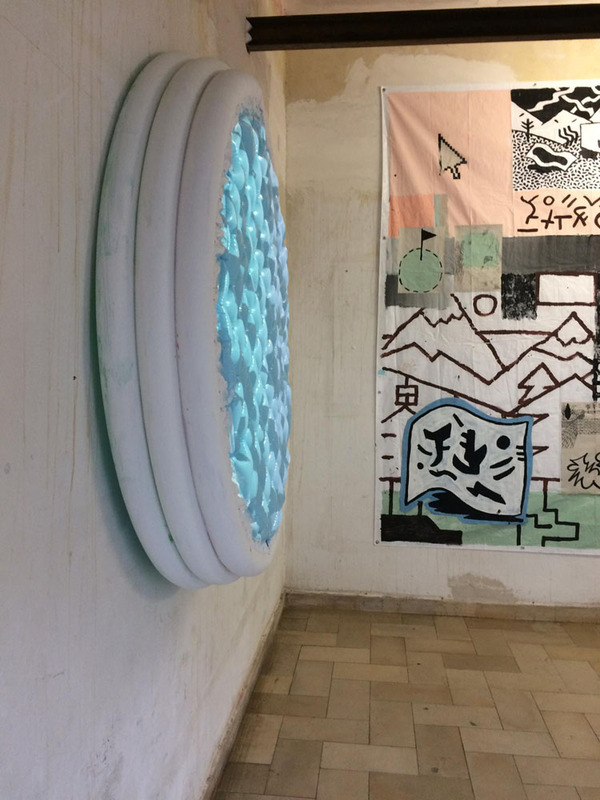 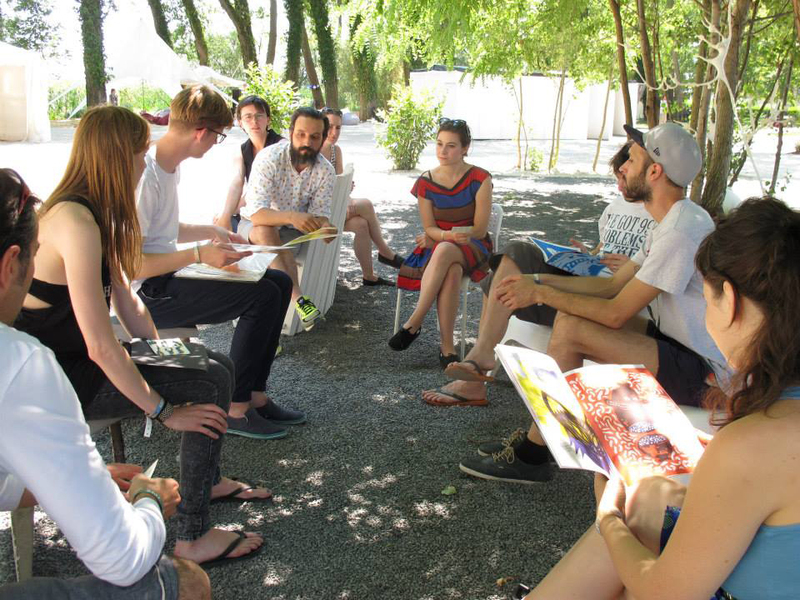 We were invited to Tihany, Balaton by Claudia Martins of Brody Art Yard Budapest to do a workshop with artists from the Art Placc Festival. 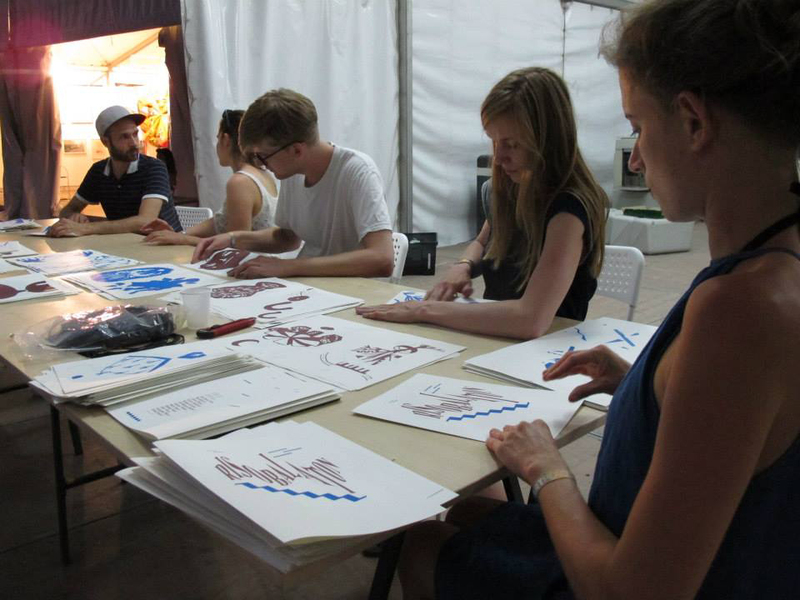 Not only did we have the chance to work with talented people, we also had quite a good time swimming at the yacht club. 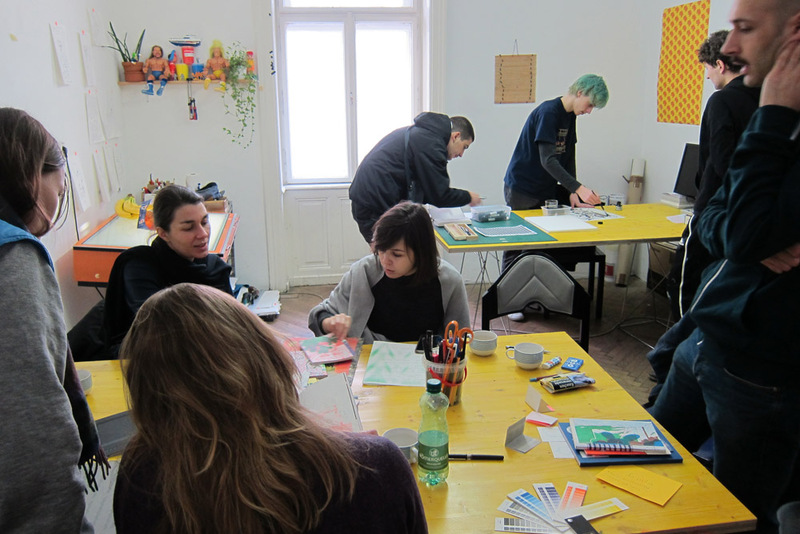 Risobalaton was produced during this workshop. 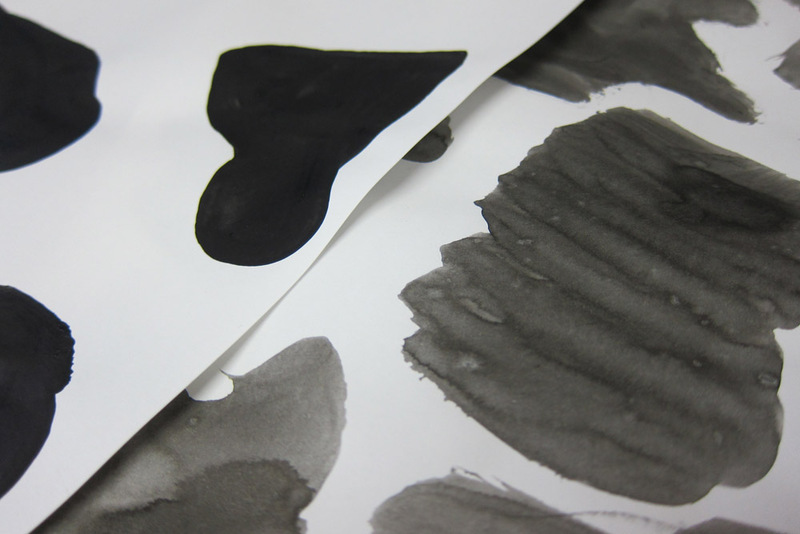 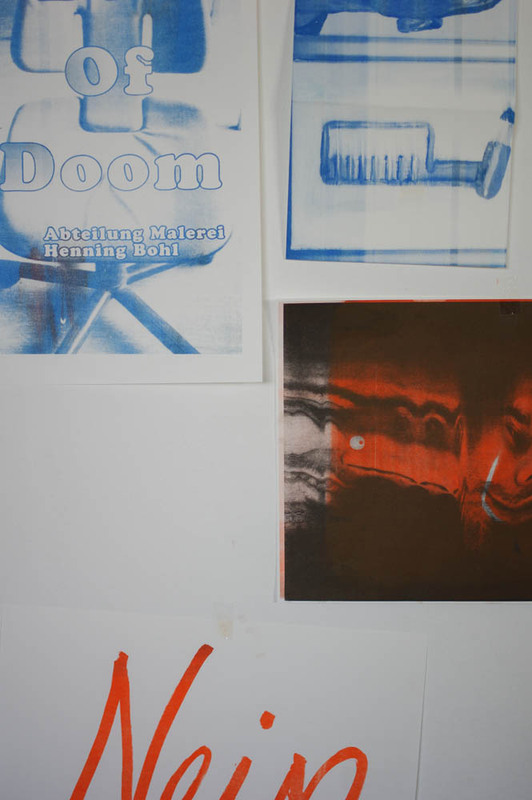 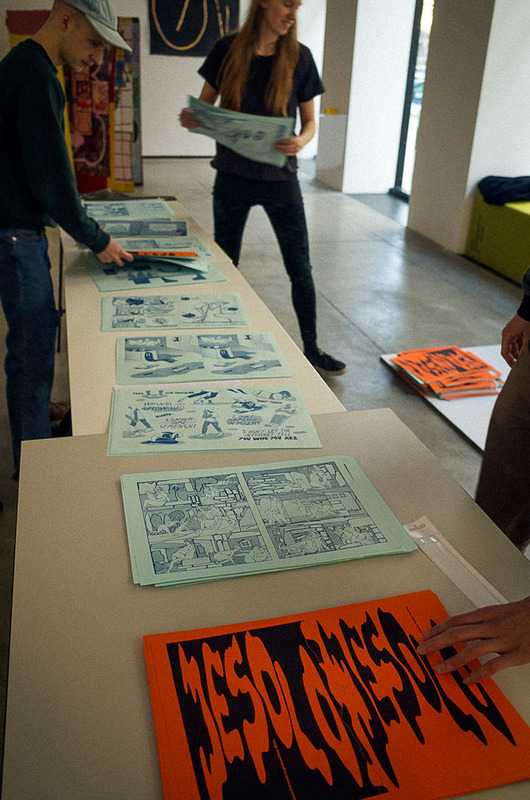 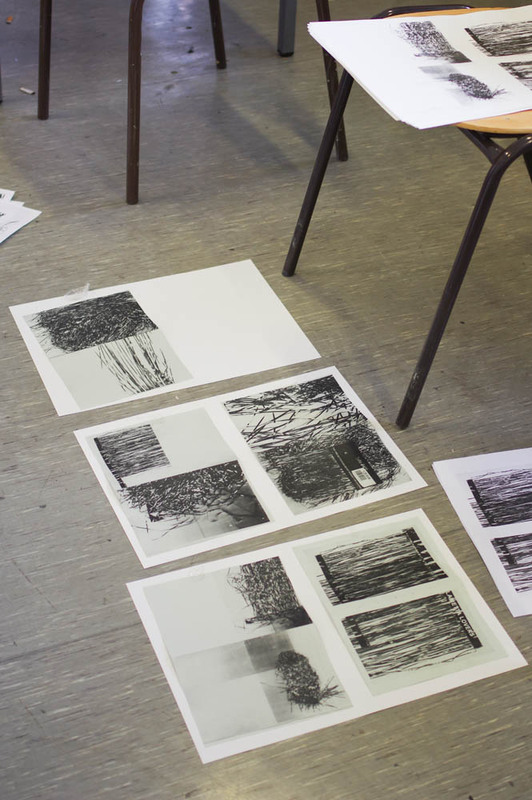 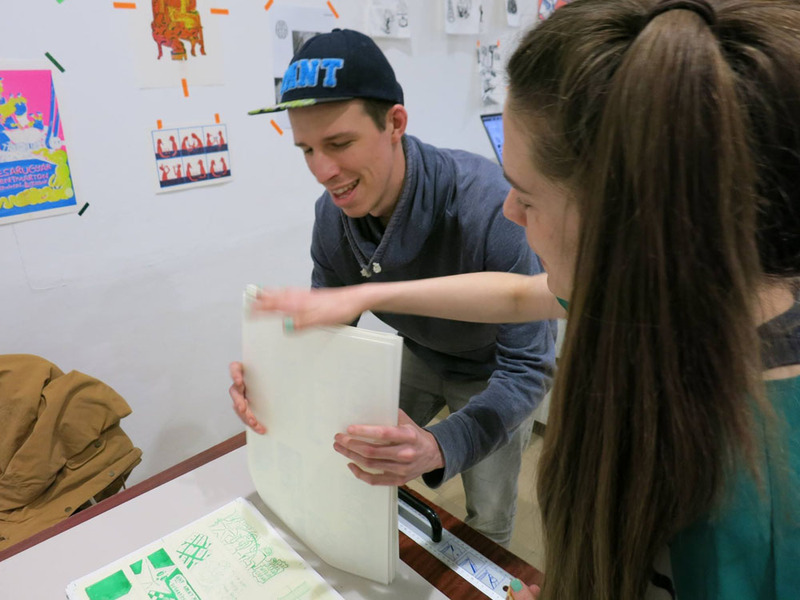 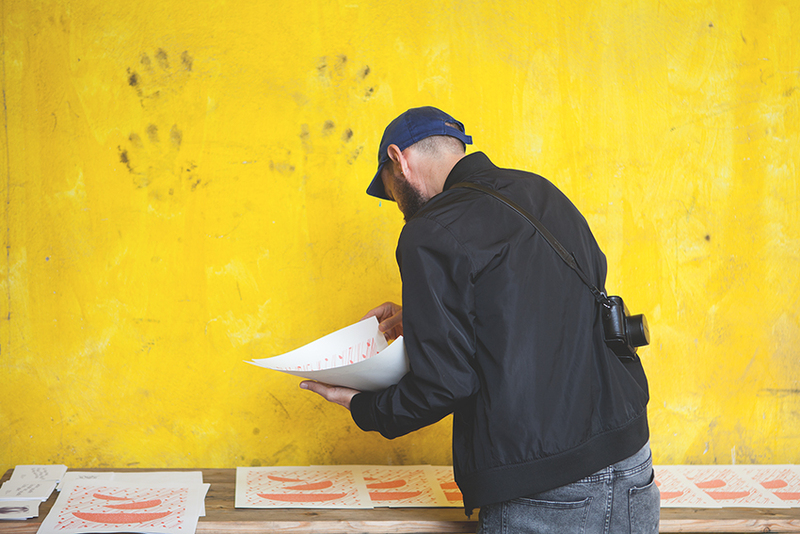 A group of students from the class for printgraphic (Prof. Jan Svenungsson) spent three days in our atelier to produce a collaborative publication. 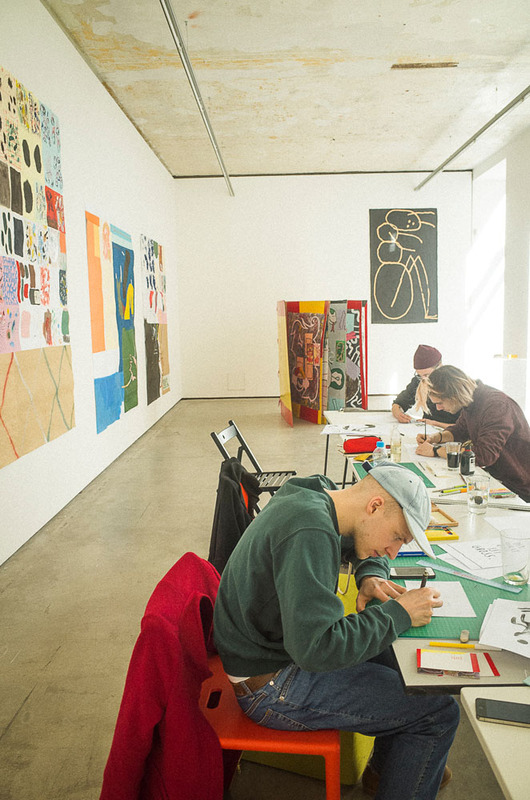 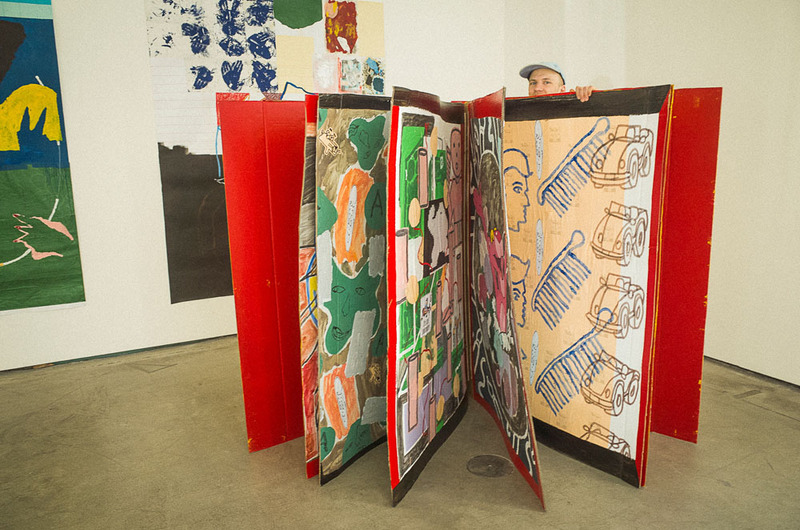 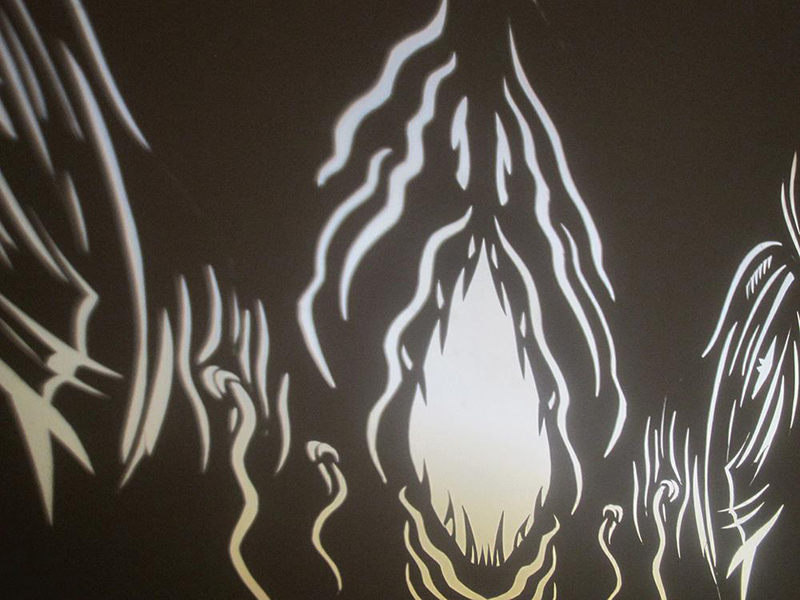 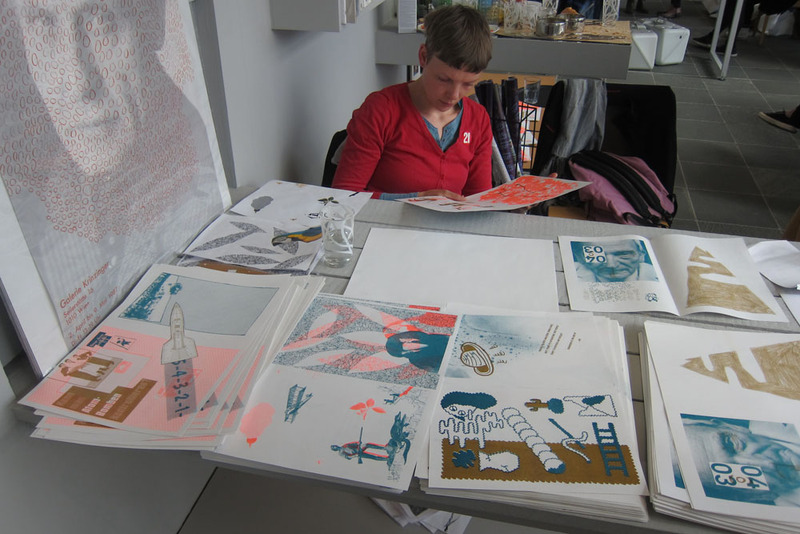 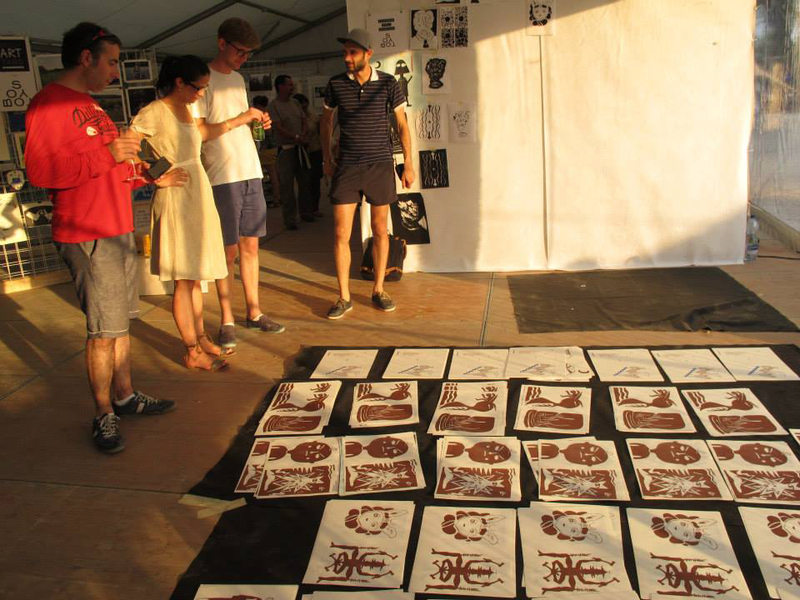 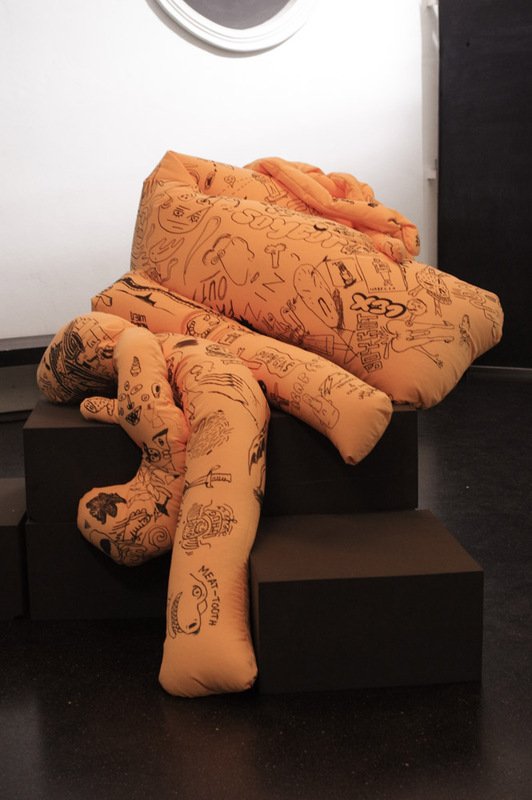 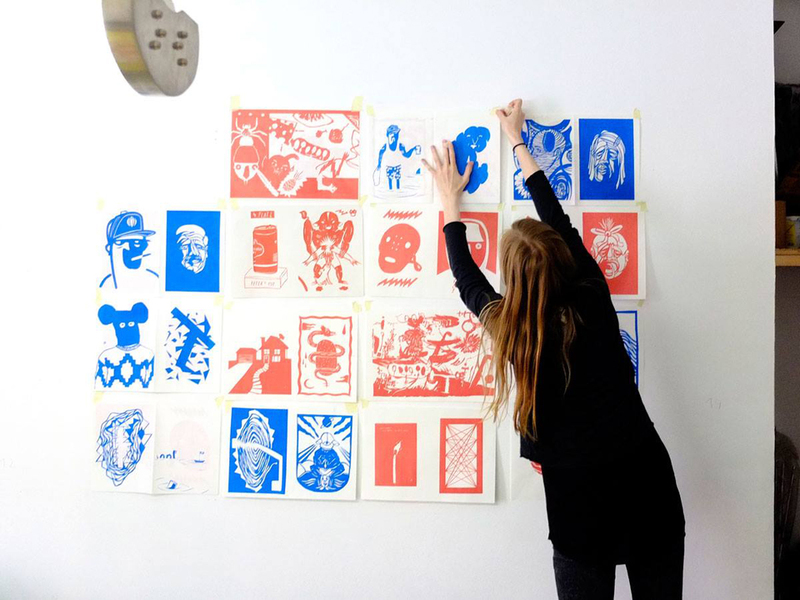 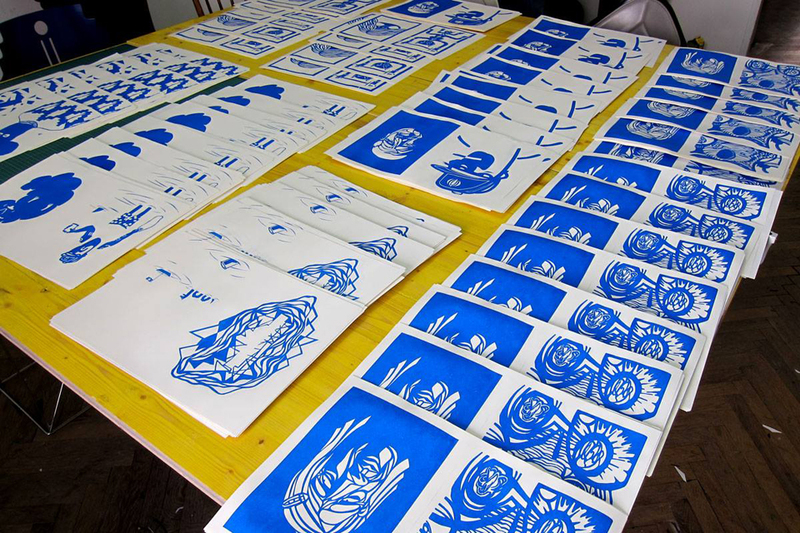 The technique of papercut, printed with the risograph, brings together the different drawing styles of the participants. 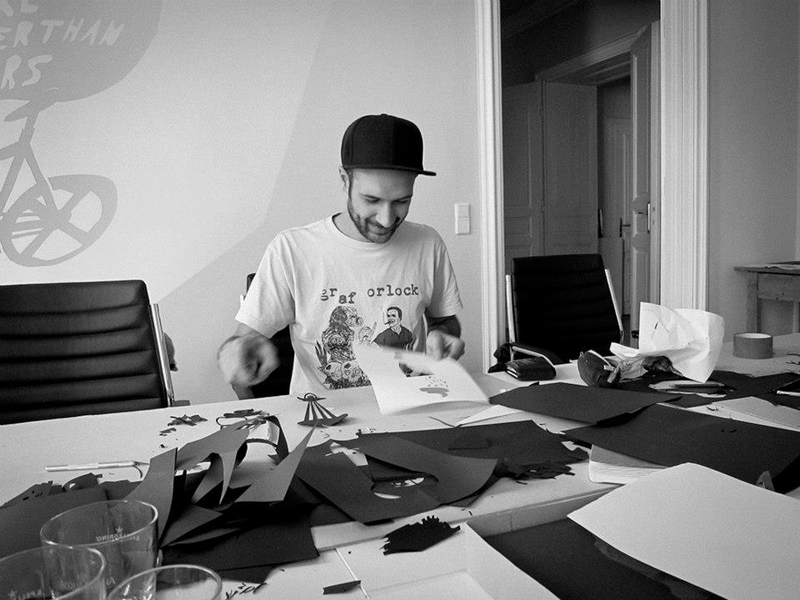 Temporaryisforever was produced during this workshop. 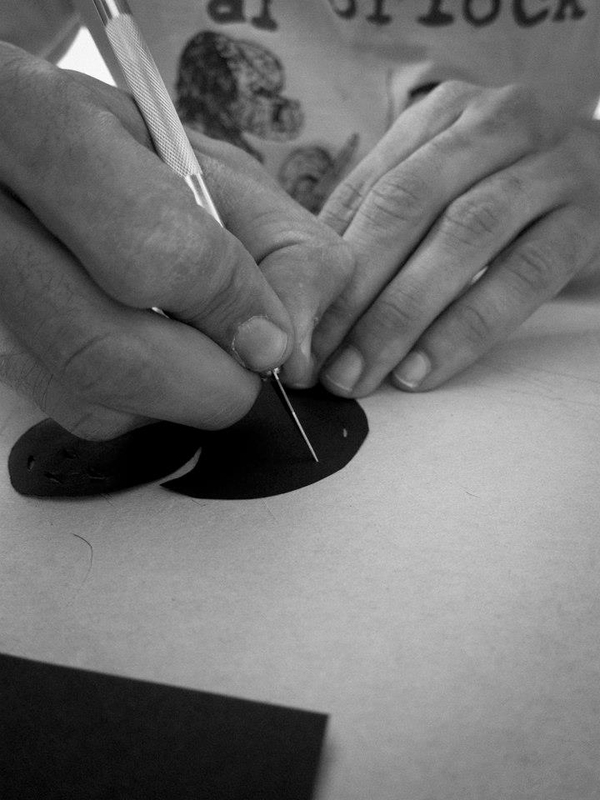 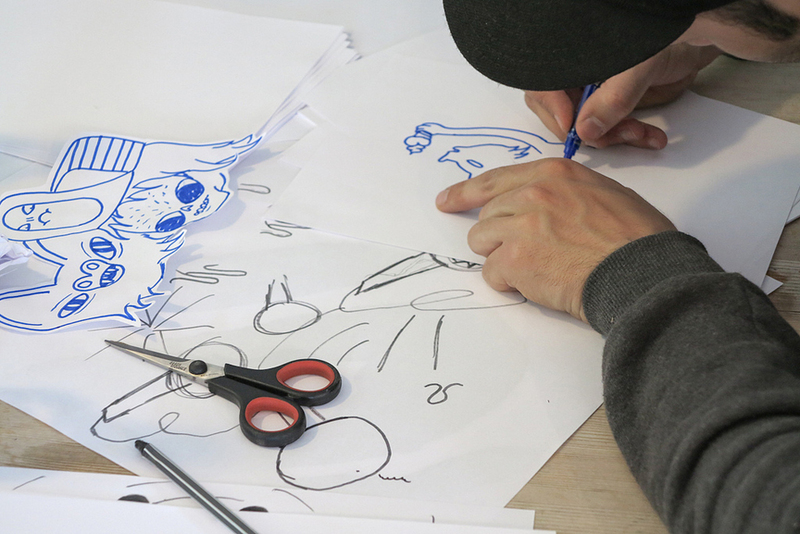 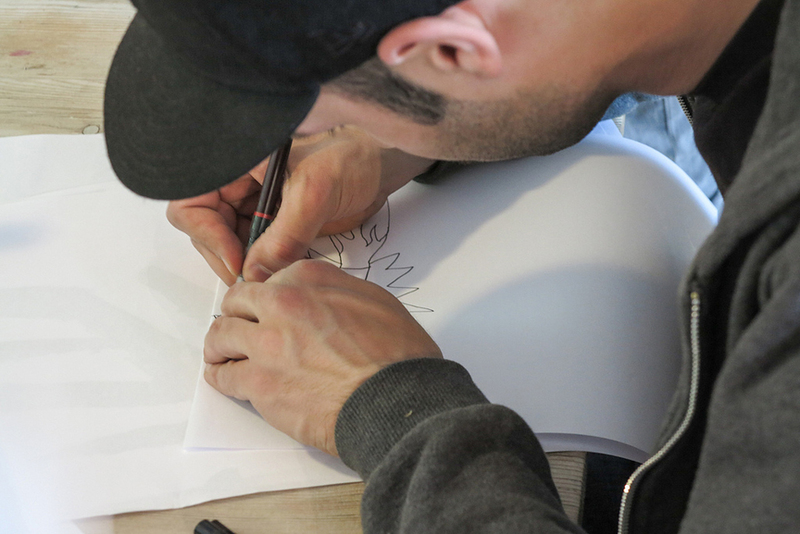 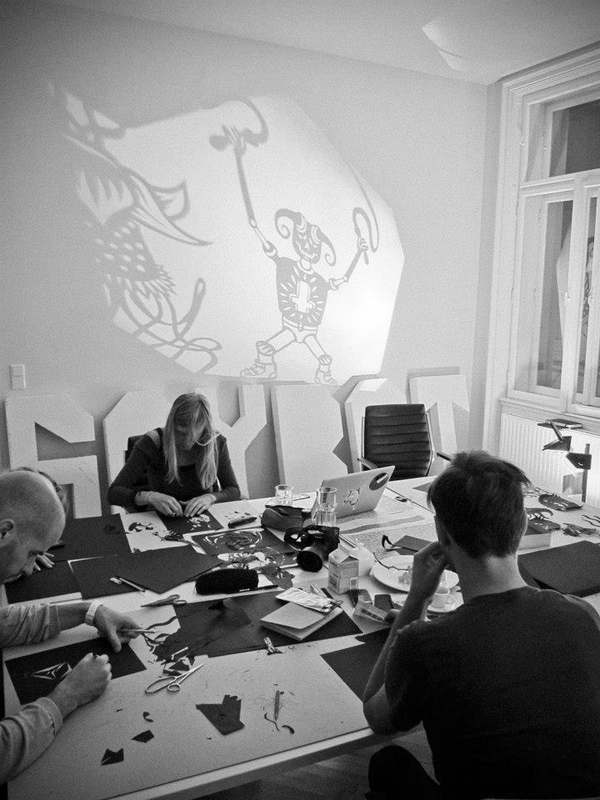 During the Vienna Design Week 2012 Soybot was invited by paperproducer Fedrigoni to do a workshop in their showroom in Vienna. 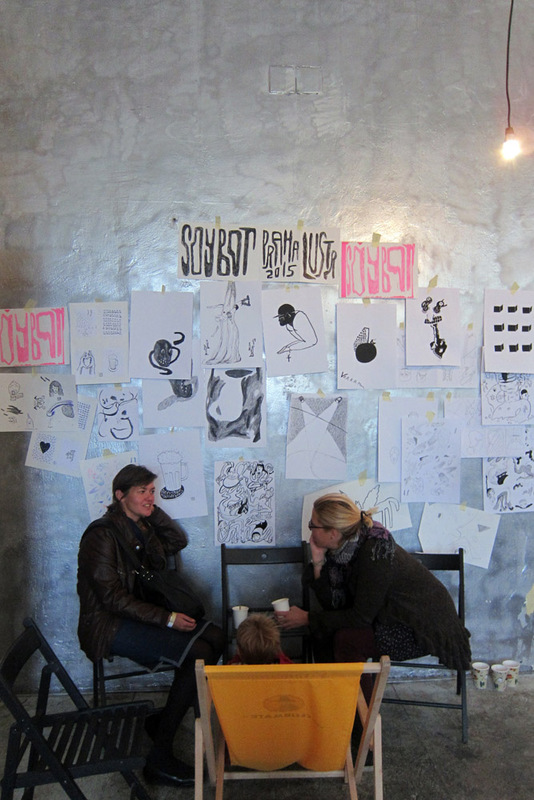 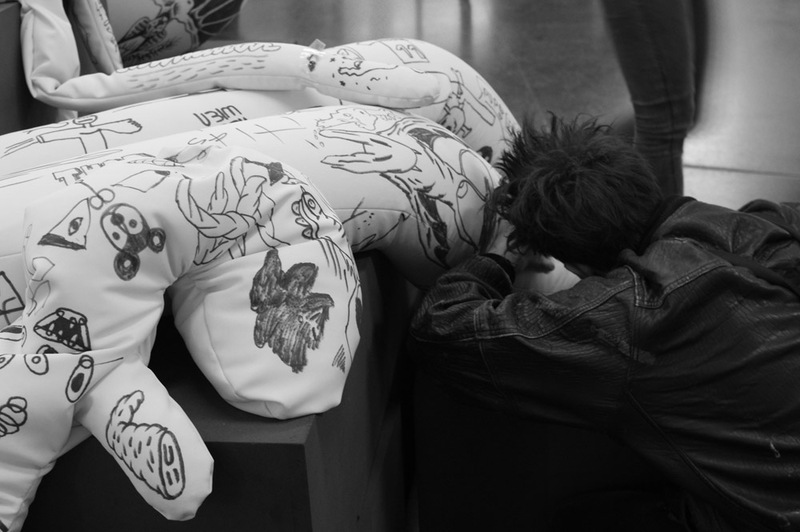 For three days people were able to stop by, work, print and hang out with Soybot. 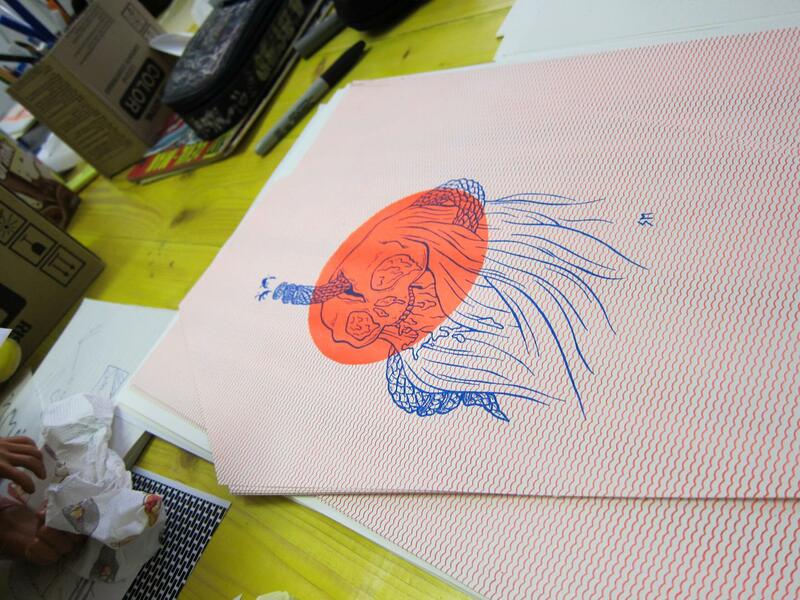 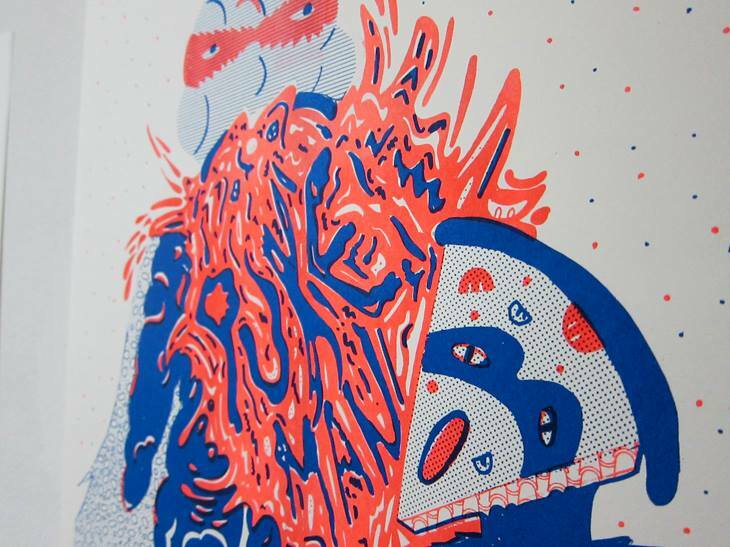 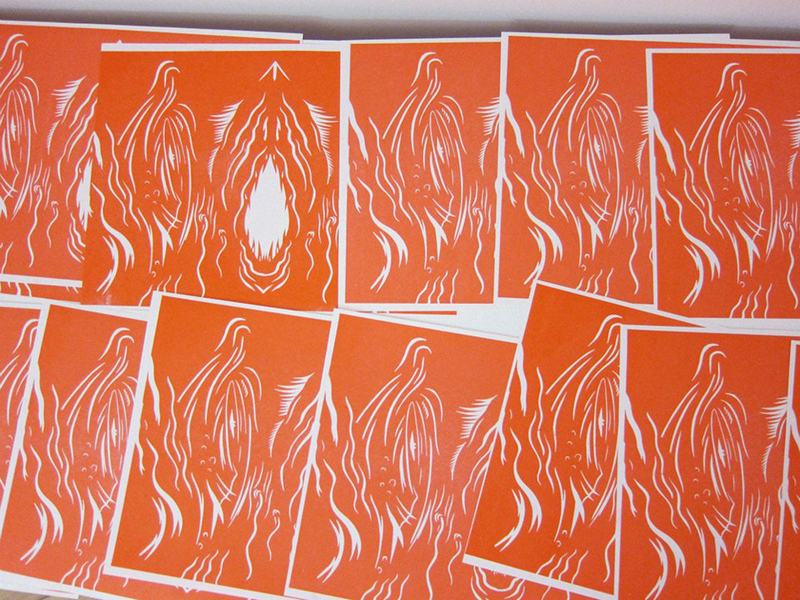 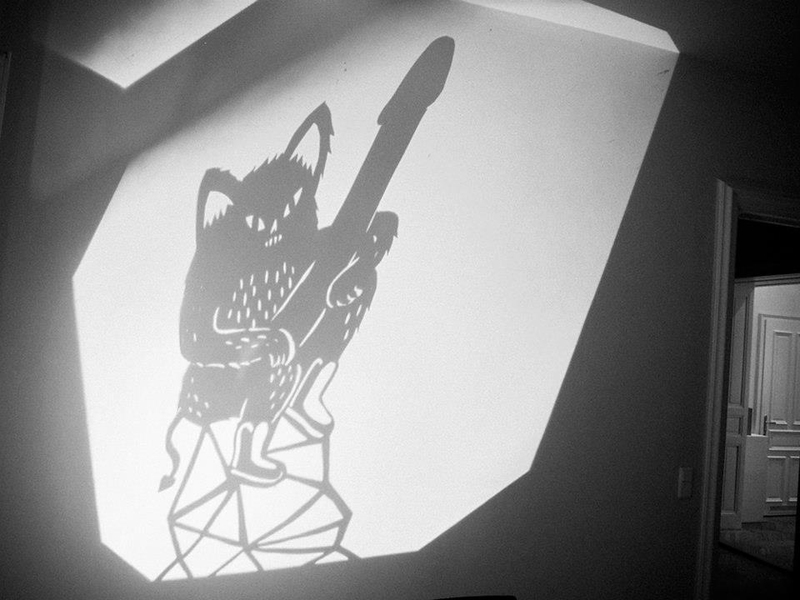 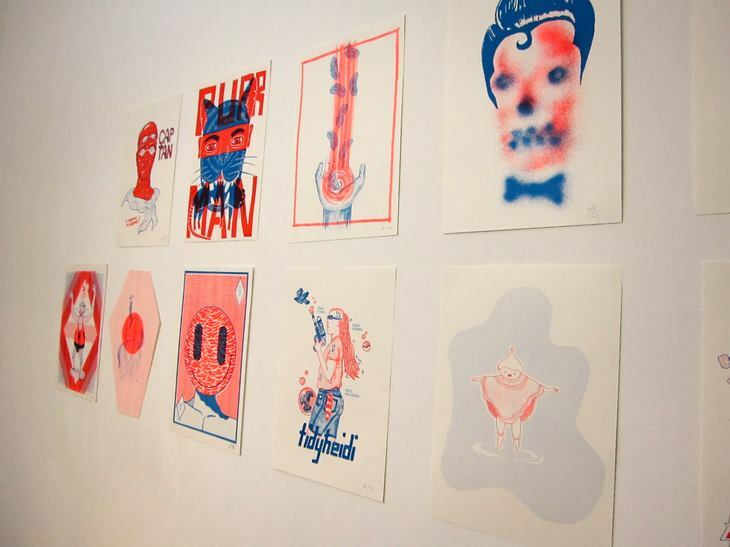 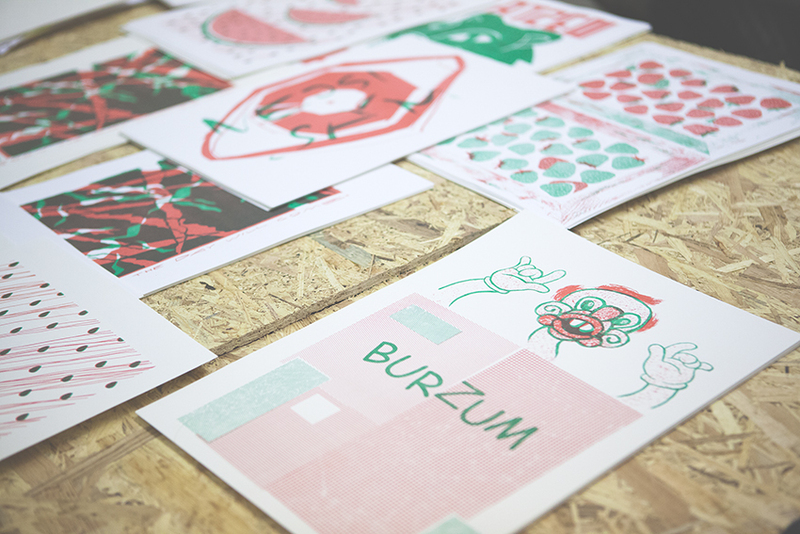 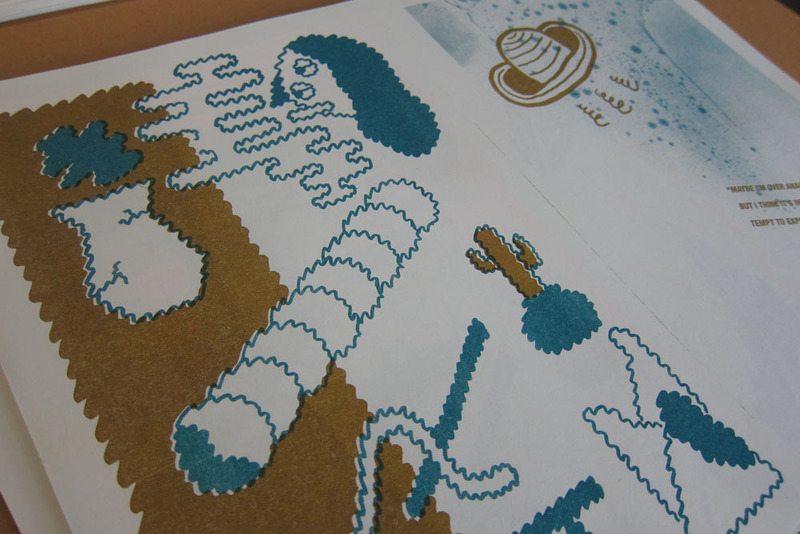 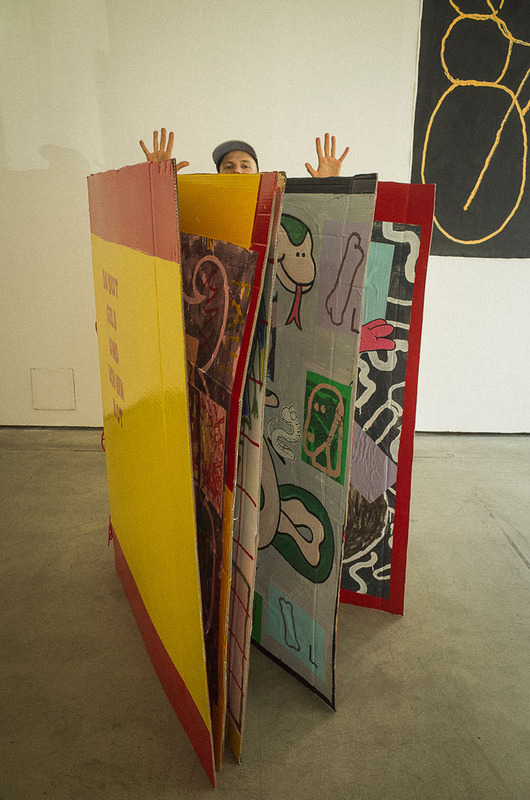 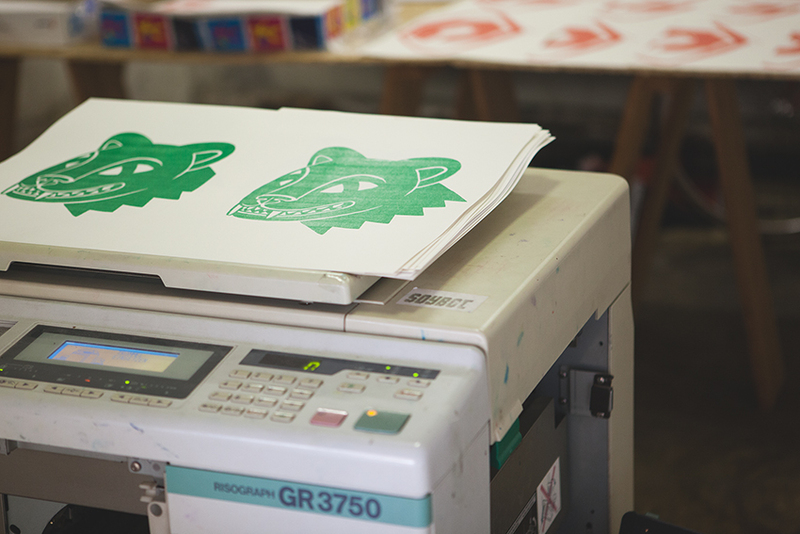 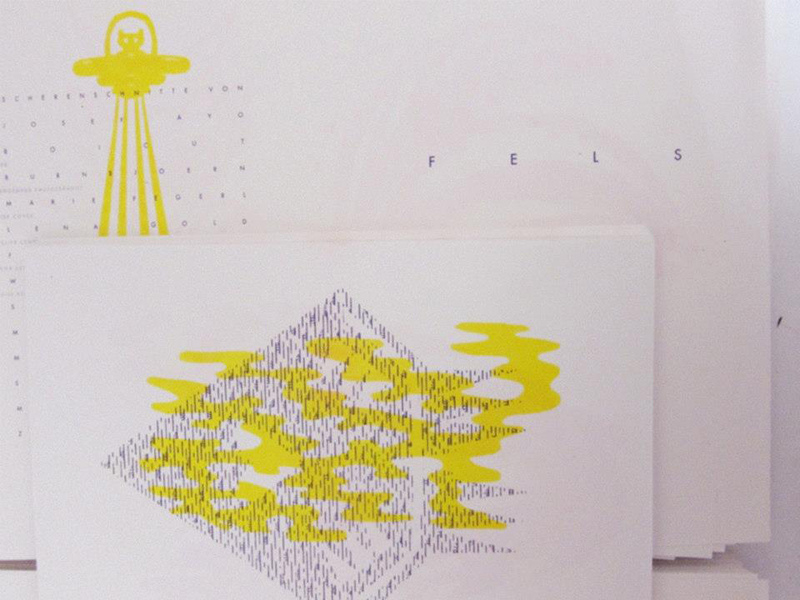 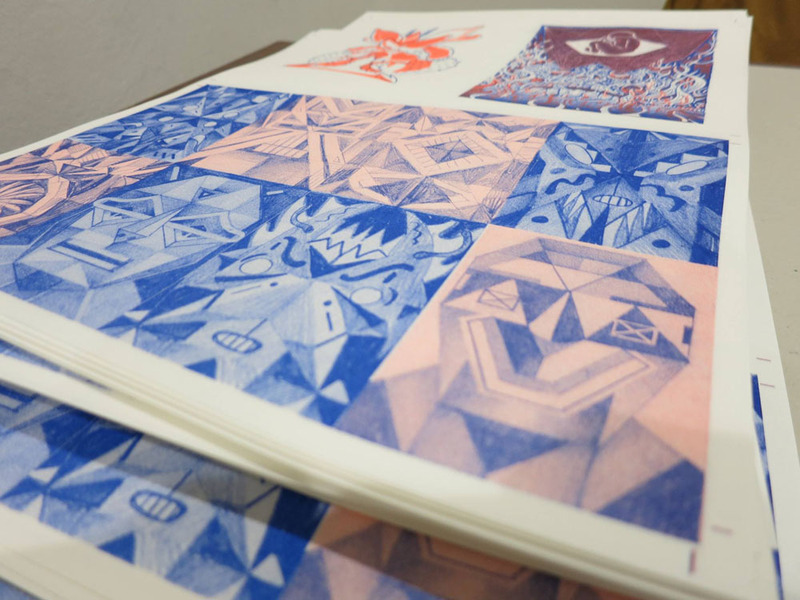 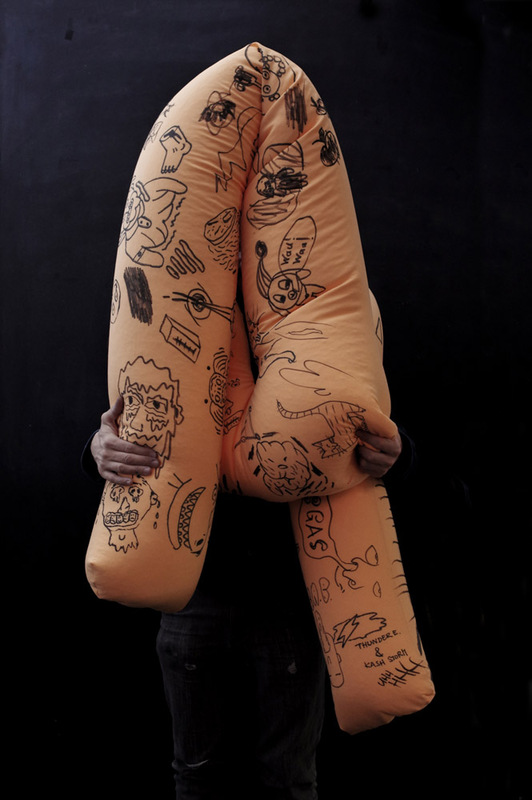 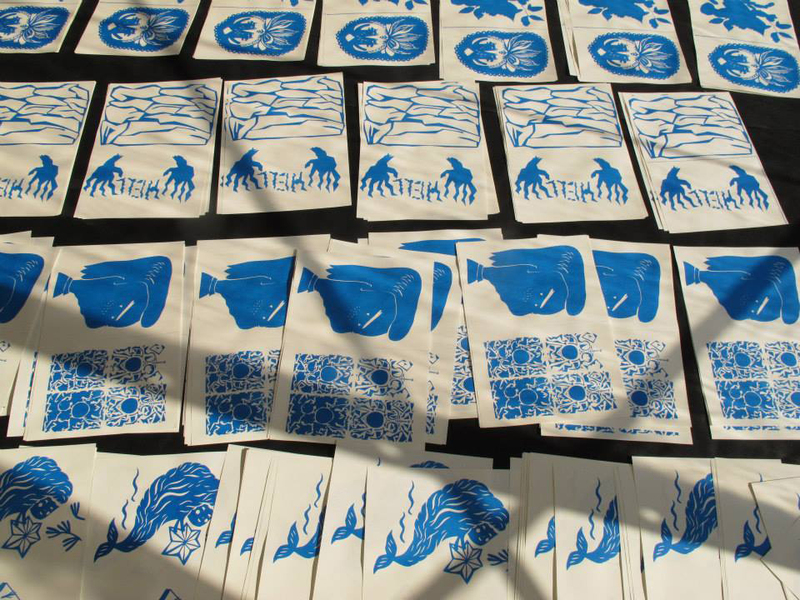 The illustrations were cut from paper and printed directly with the risograph. 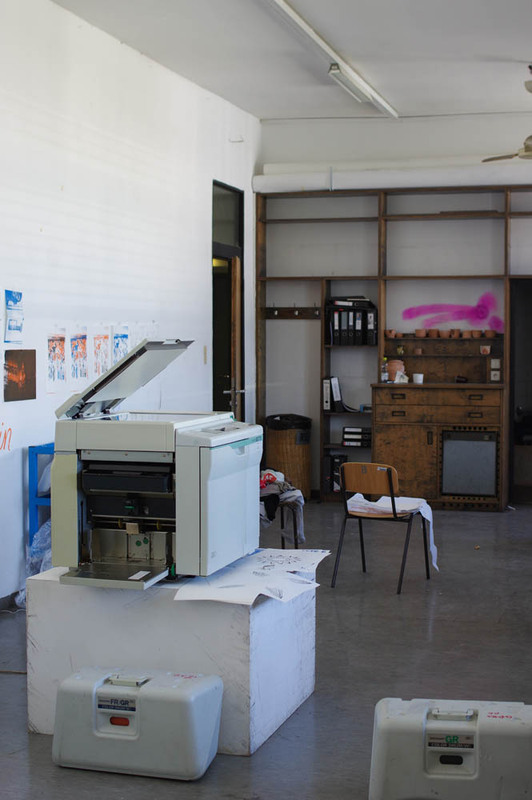 – All analog, no computer. 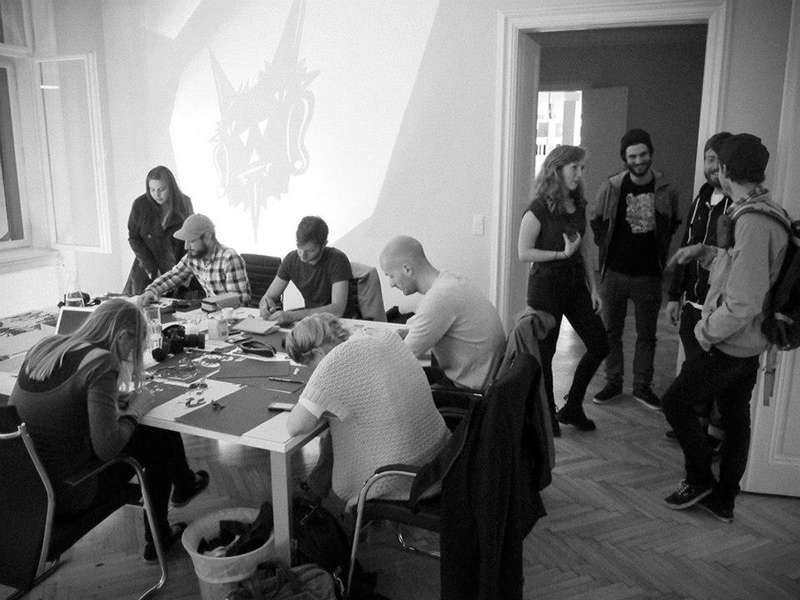 As a topic everything was allowed but snowflakes and stars. 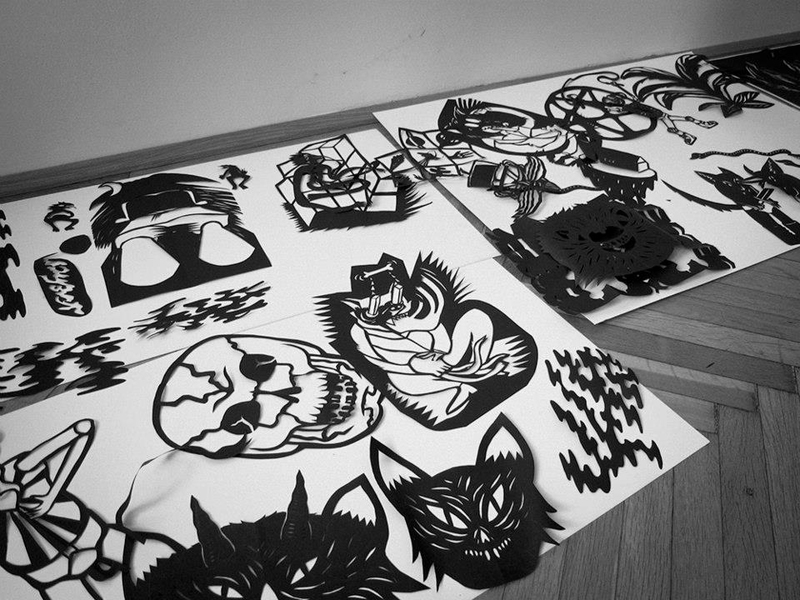 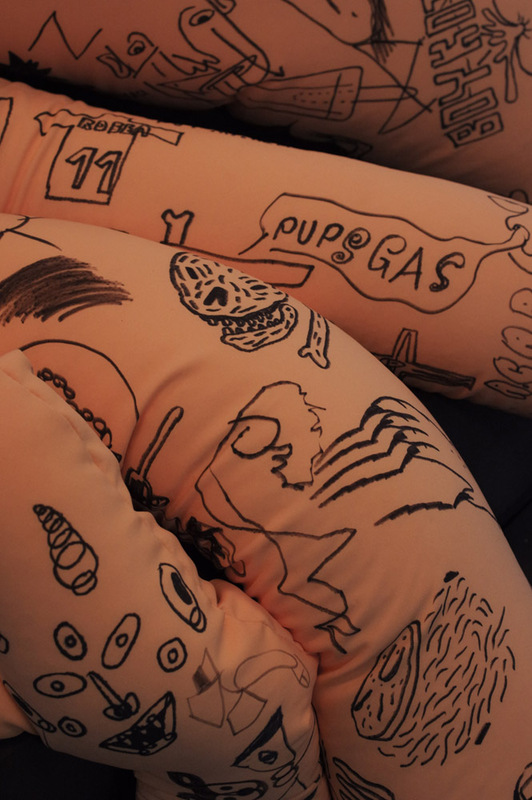 The covers were laser-engraved by rausgebrannt. 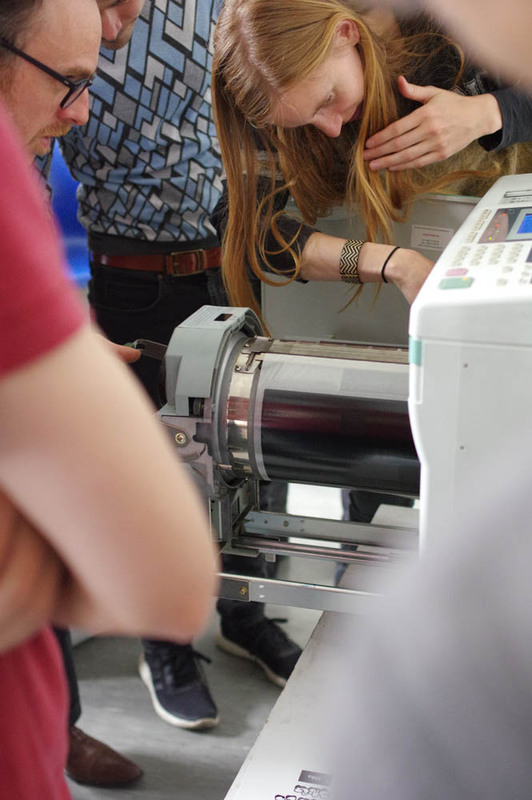 Fels was produced during this workshop. 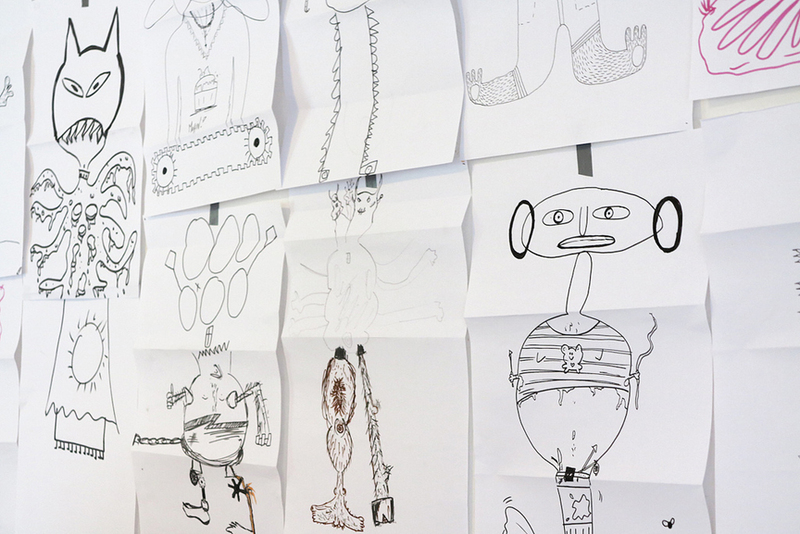 Everyone should know how to draw monsters. 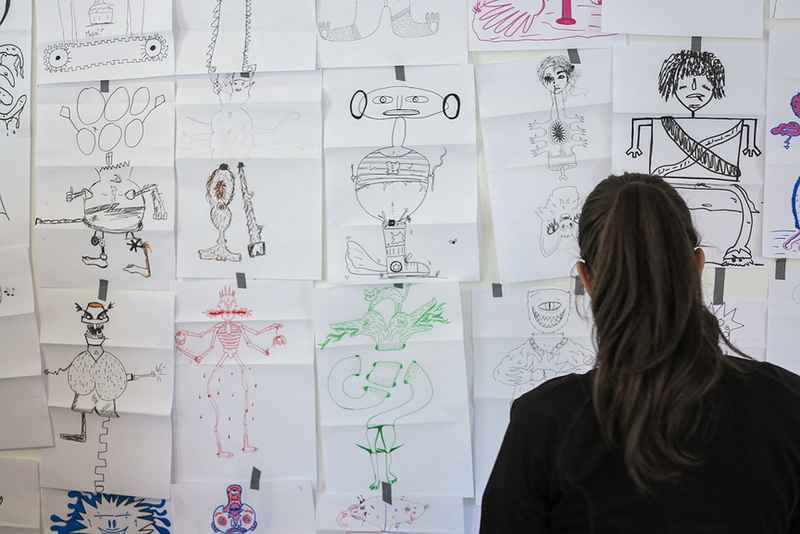 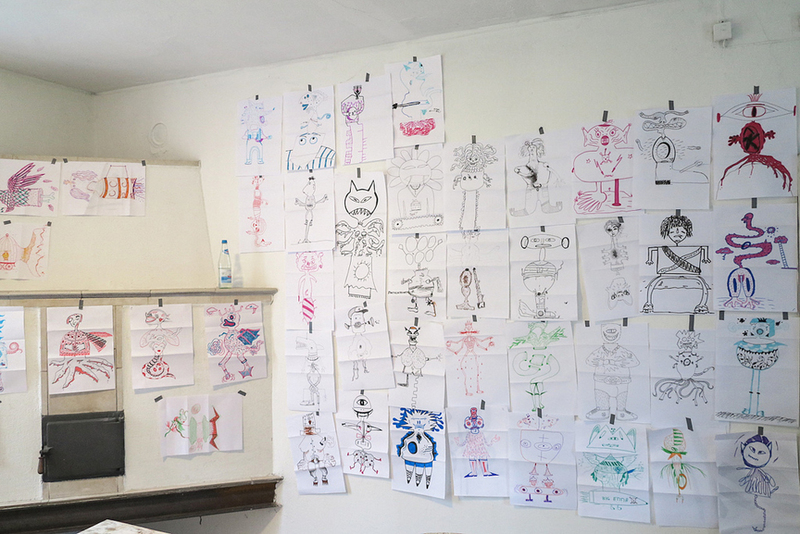 During two days around 30 participants between 4 and 40 years talked about monsters, scribbled monsters, cut out monsters and drew monsters. 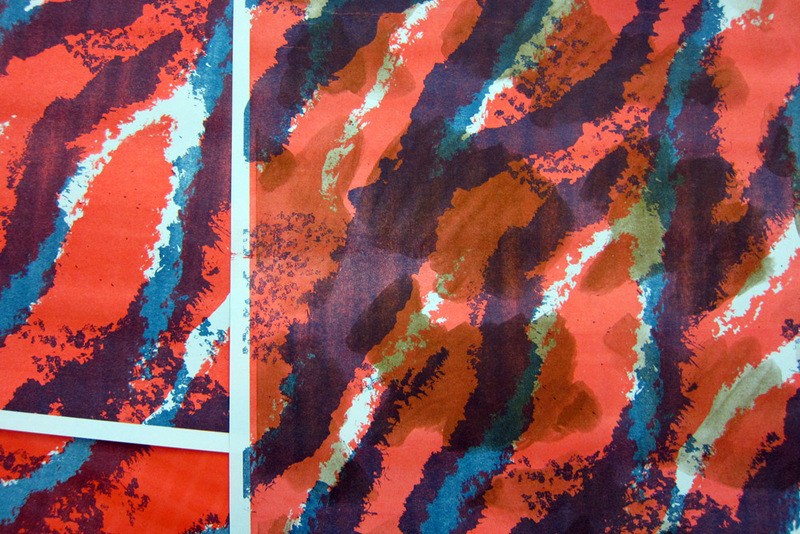 The results were printed in an edition of 30. 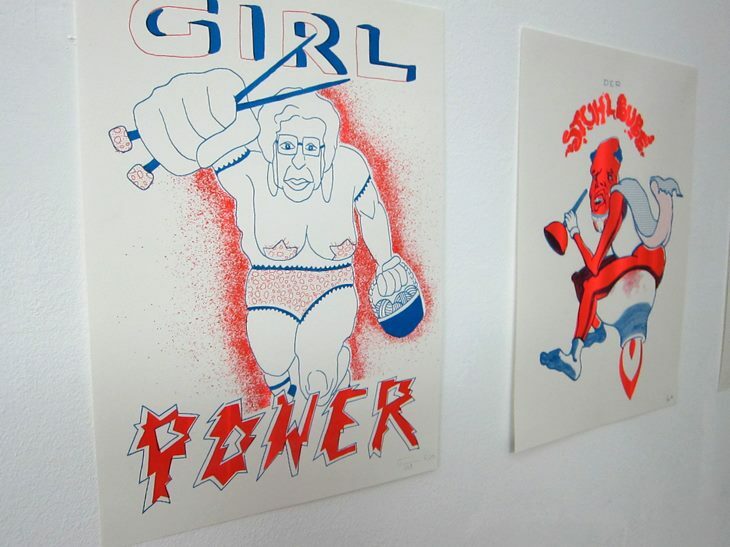 Schiach! 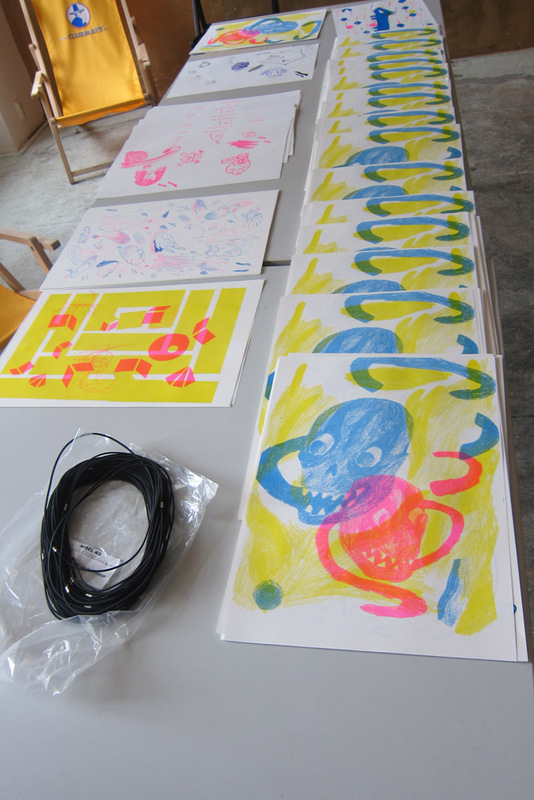 was produced during this workshop.